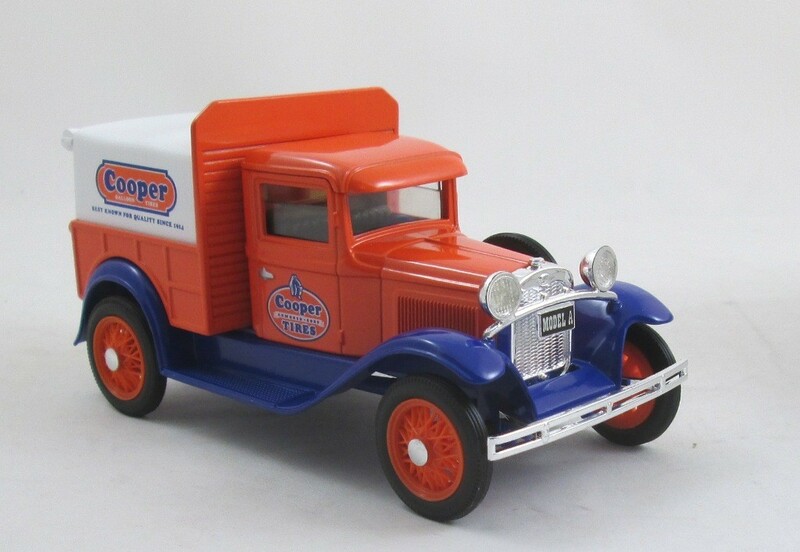 This page will include Die-cast 1/34 to 1/25 scale trucks of Chevrolet, Ford, GMC, Mack, White, International and more. 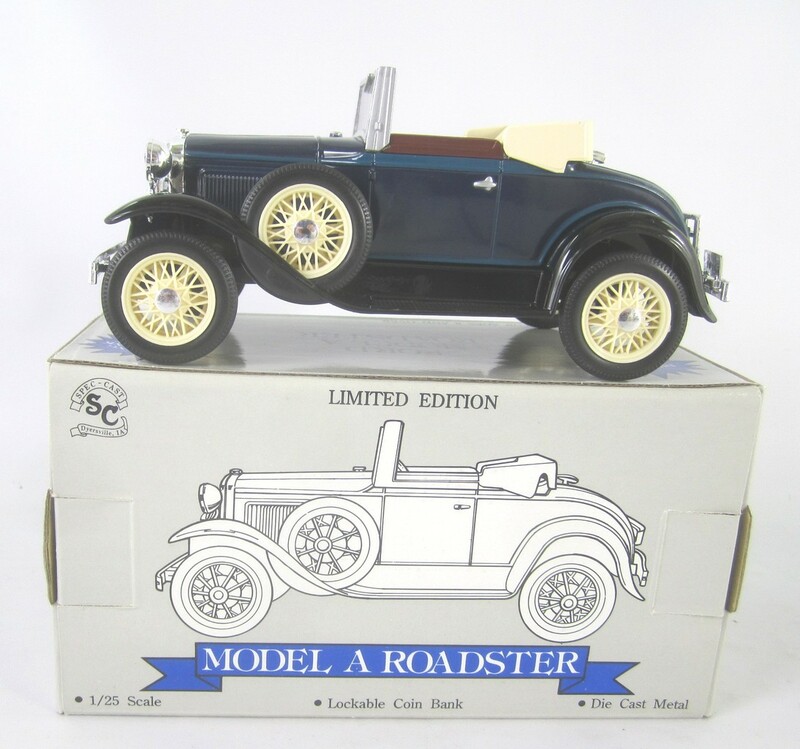 They were made by Ertl Collectibles, Spec Cast and JLE Scale Models. 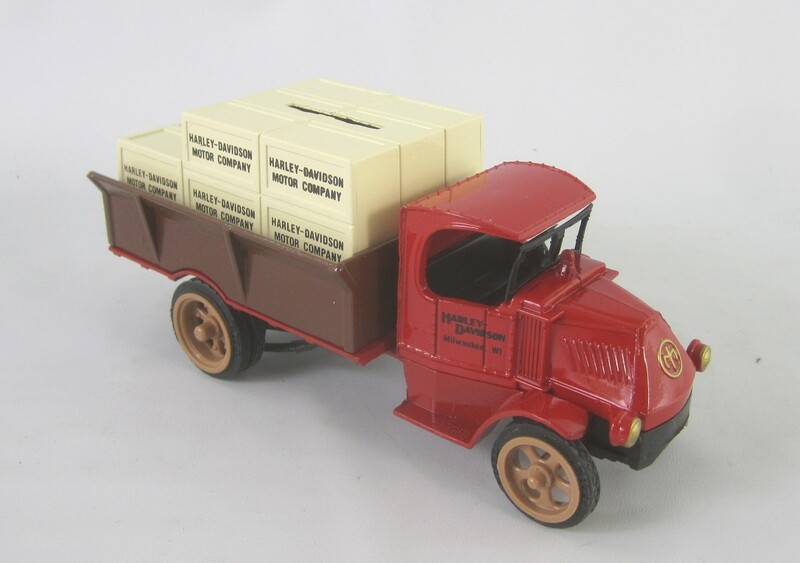 Ertl Stk# 3741 1938 Chevy Panel Truck Bank. 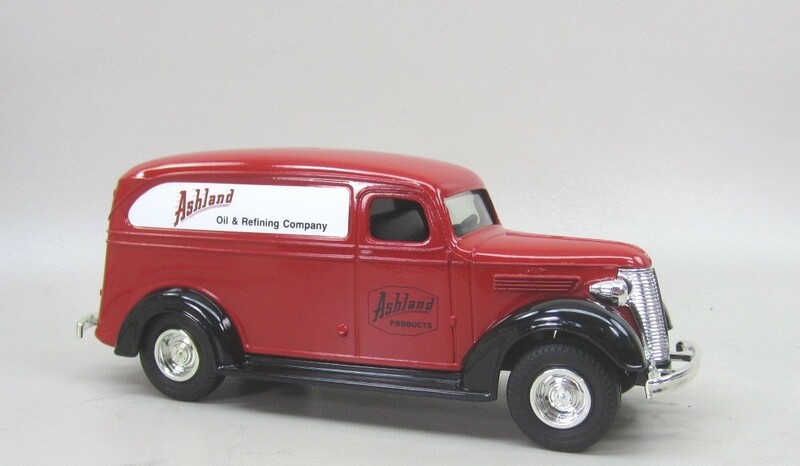 This bank was made for Ashland Products as #2 in the series. 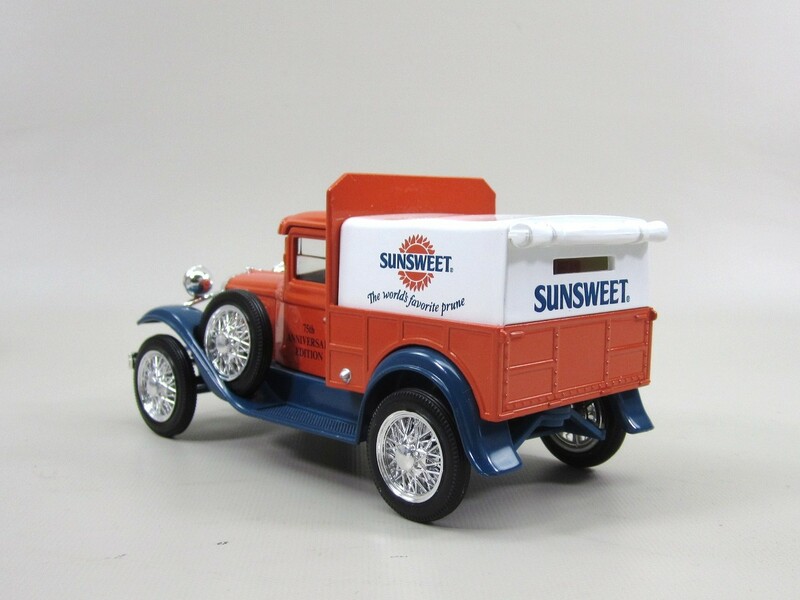 Diecast 1/25 scale with rubber tires. Coin slot in roof. 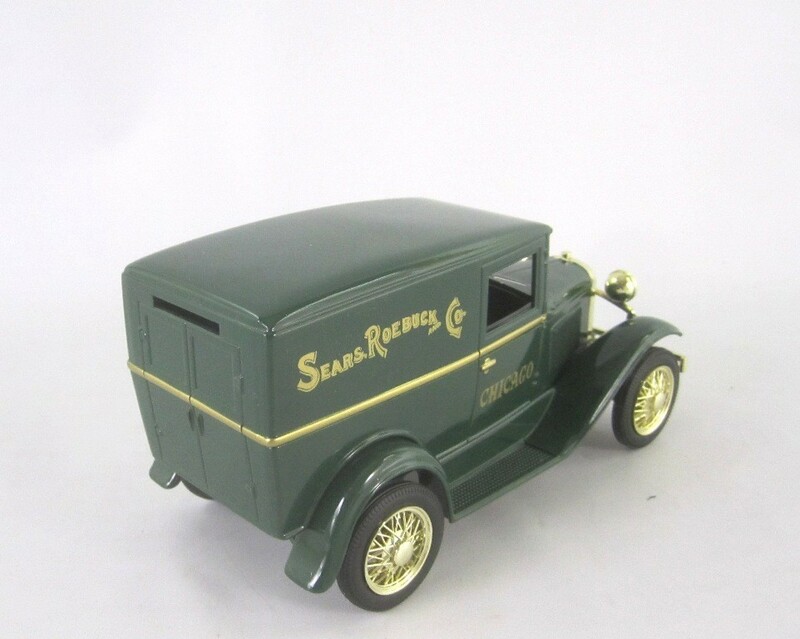 Ertl Stk# 9029 1917 Ford T Delivery Van. 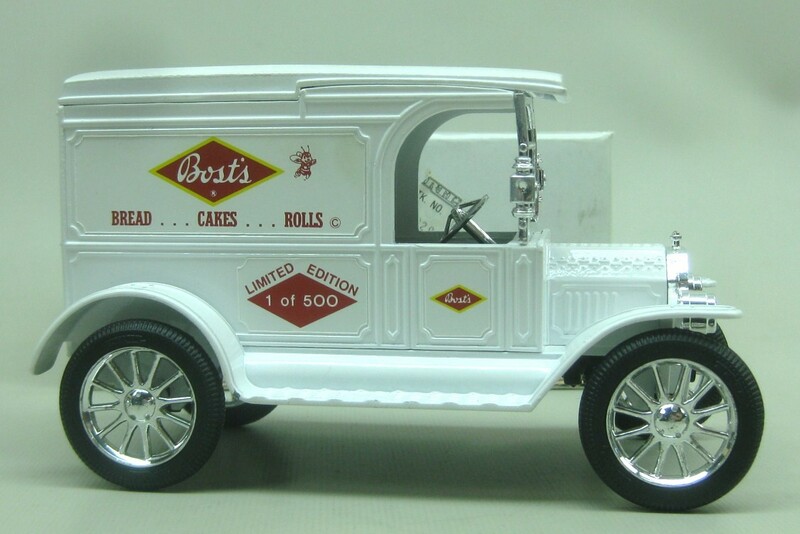 This coin bank was made for Bost's Bakery. Limited 1 of 500. 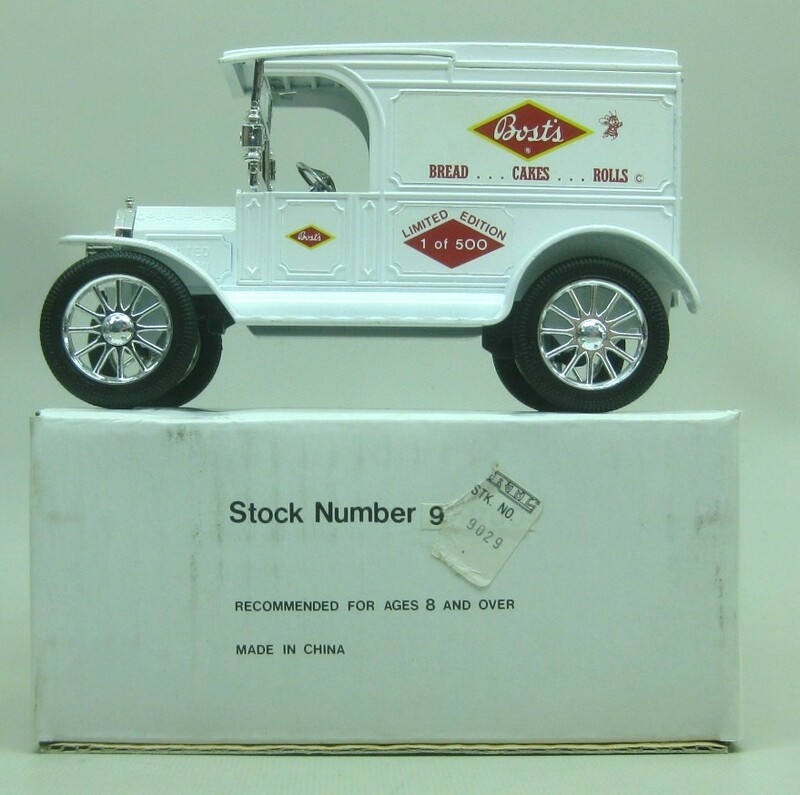 Die-cast 1/25 scale (6 in long). New in Box, Opened only for photo. 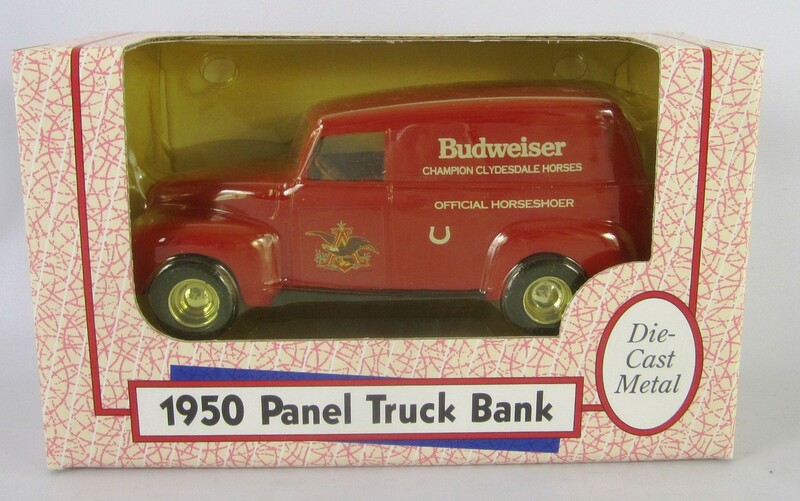 Ertl Stk# 2986 1950 Chevy panel Budweiser Official Horseshoer. 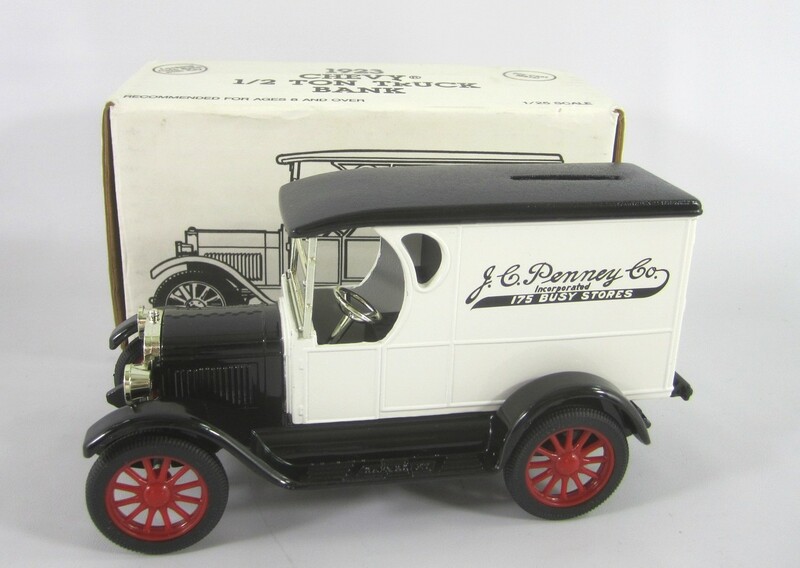 Diecast 1/25 scale (6-1/2 in long) with rubber tires. Coin slot in roof. #6 in the series from 1992. New in Box. Clam shell packaging has some yellowing. 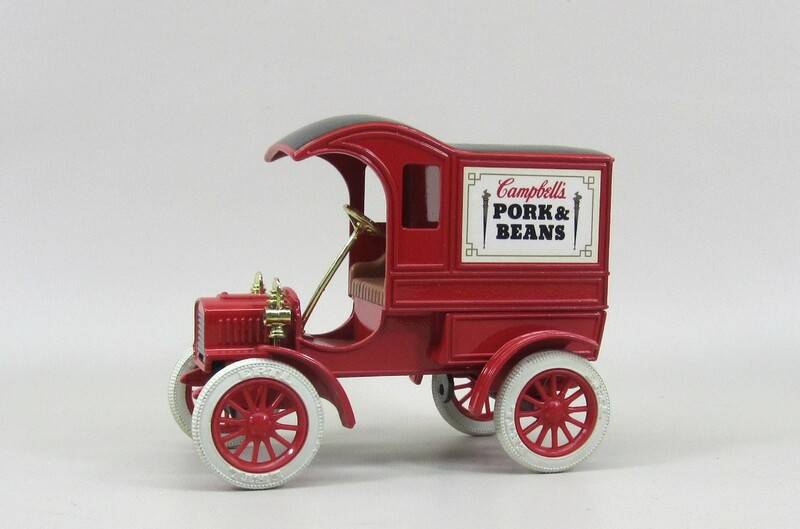 Ertl Stk# 9394 1905 Ford T Delivery Campbell's Pork & Beans. 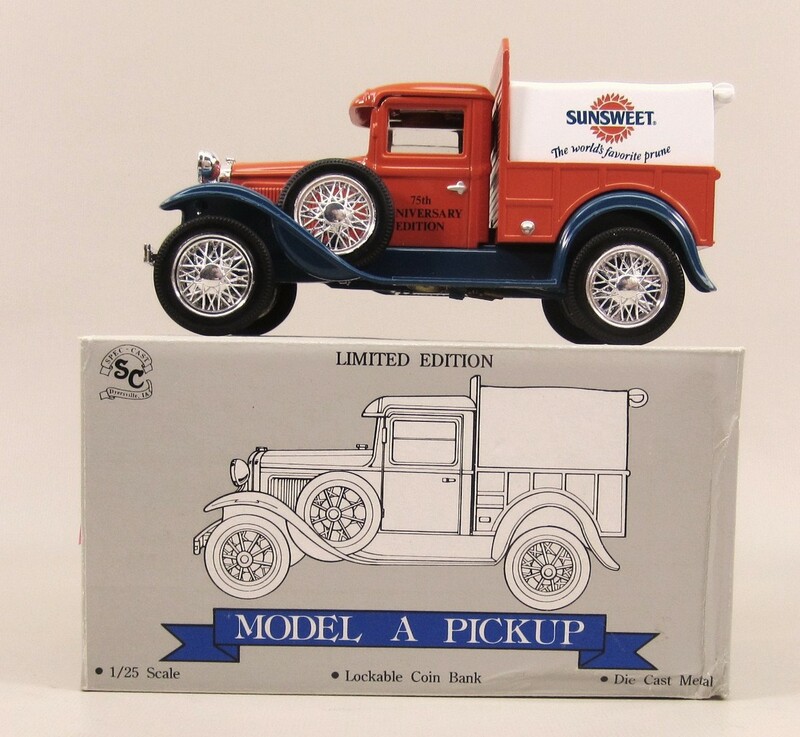 Diecast 1/25 scale with rubber tires. Coin slot in roof. 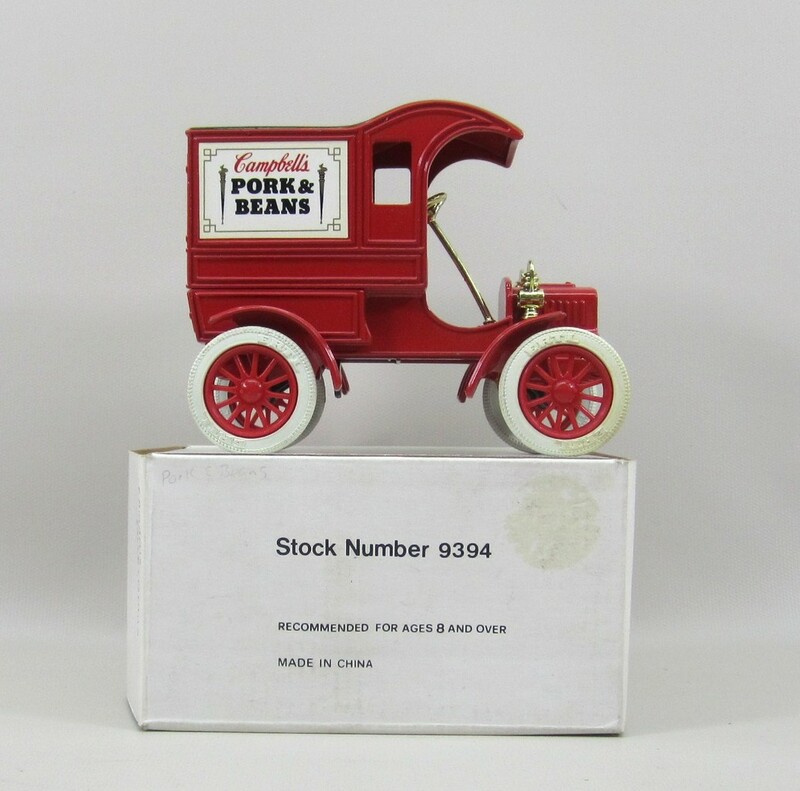 #1 in the Pork & Beans Series. 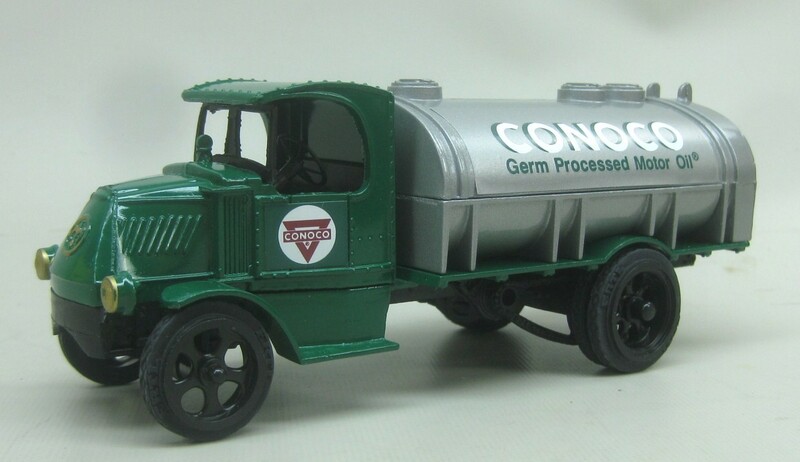 Ertl Stk# 3726 Clark Oil & Refining 1931 Hawkeye Tanker Truck Bank. Die-Cast metal with rubber tires. Made in USA. 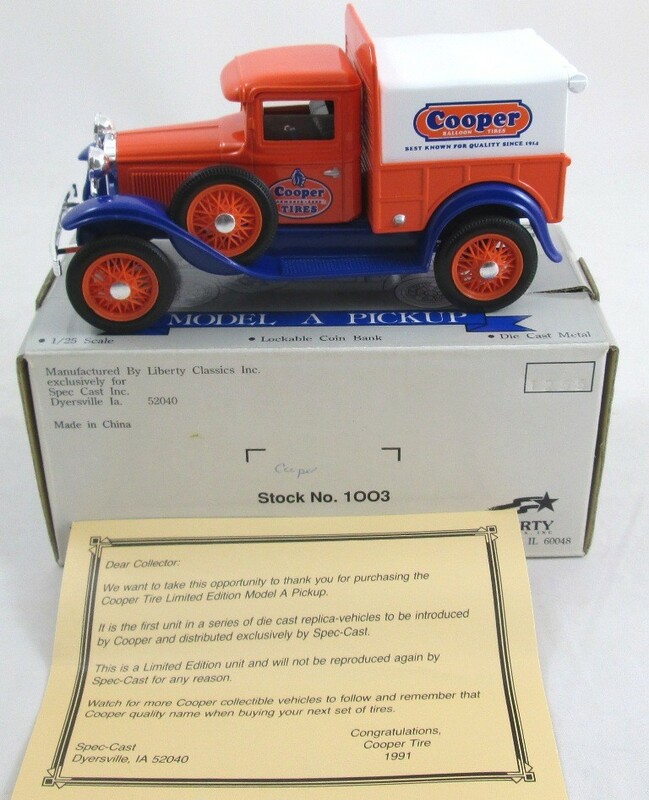 Spec Cast, Liberty Classics Stk# 1003 Cooper Tire 1930's Ford Model A Pickup truck bank. 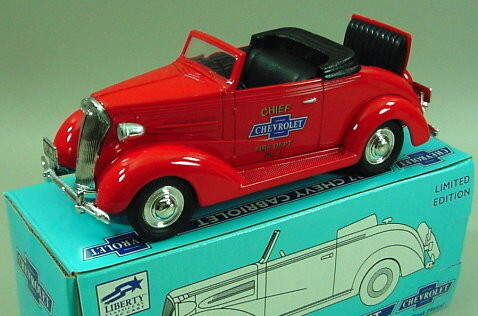 Liberty Classic Die-cast 1/25 scale (7-1/4 in long). 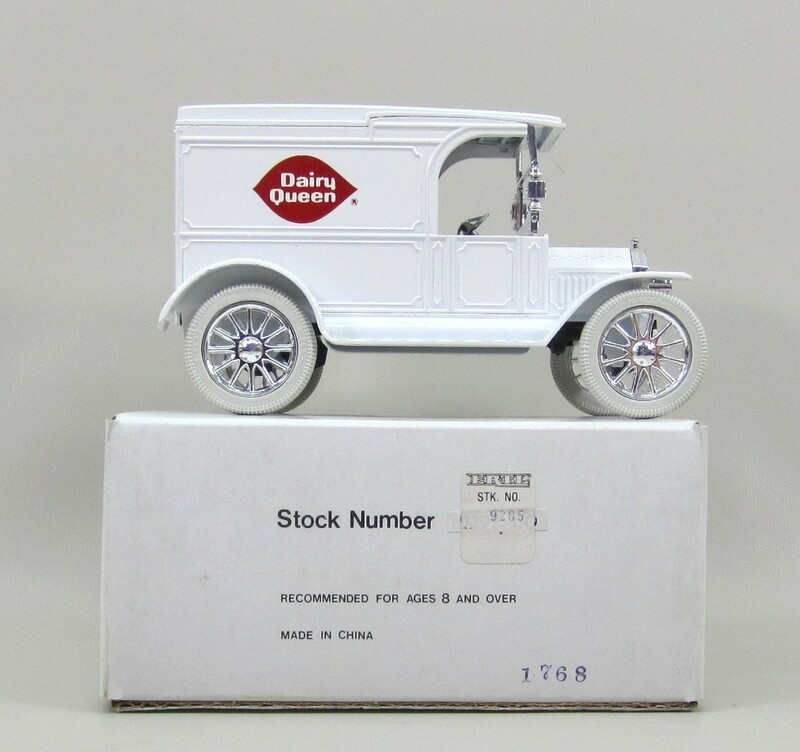 Ertl Stk# 9033 1918 Ford T Runabout Dairy Queen bank. 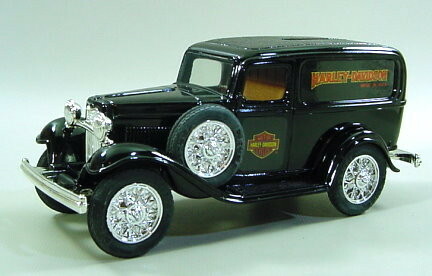 Diecast 1/25 scale with rubber tires. 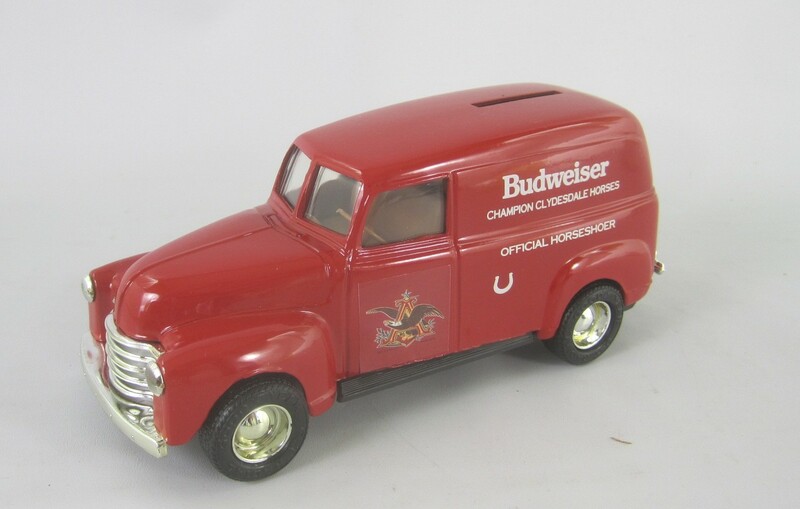 Coin slot in delivery box. Made in USA. #3 in the series from 1989 and only 660 made. 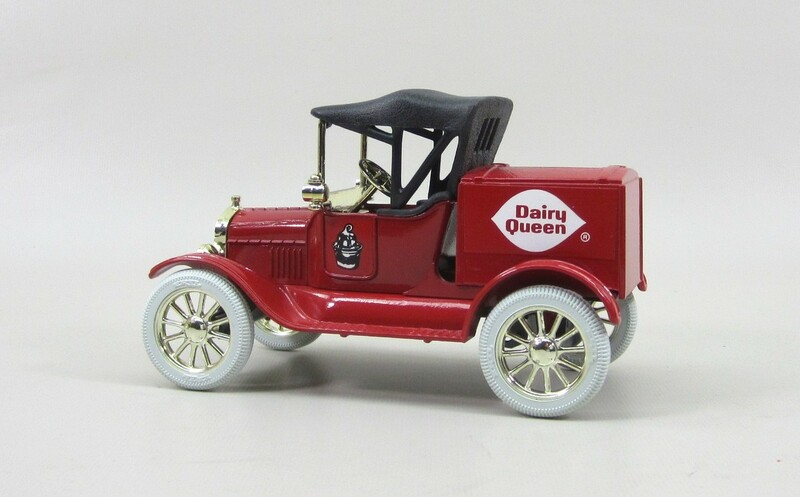 Ertl Stk# 9235 Dairy Queen 1917 Ford Model T Bank. Die-Cast metal with rubber tires. Coin Slot in Roof. 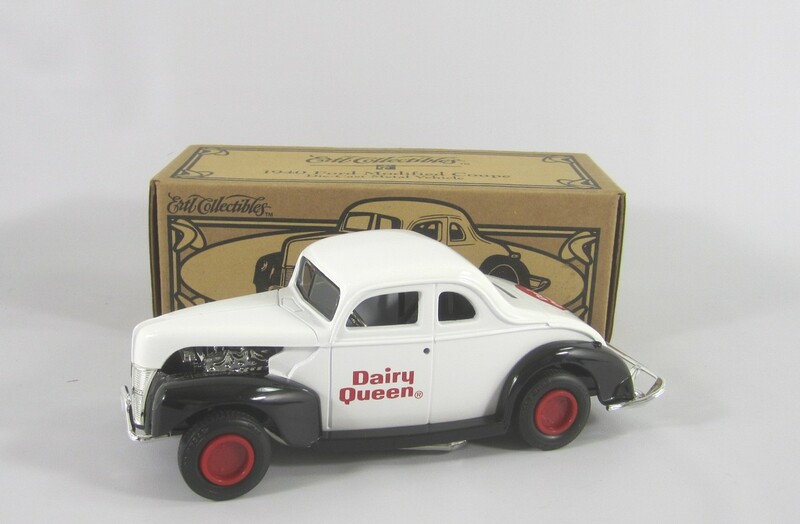 #4 in the DQ series, Only 516 made. 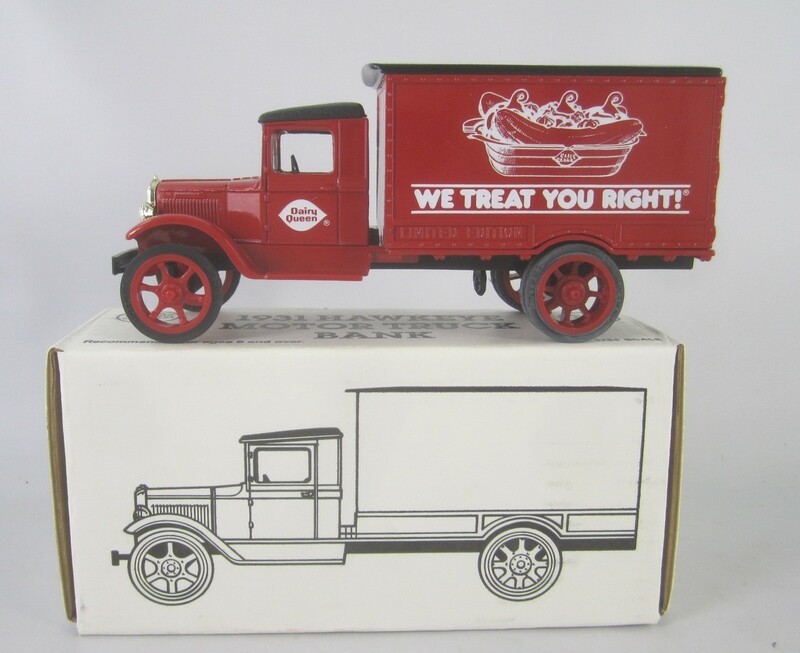 Ertl Stk# 7575 1931 Hawkeye Dairy Queen "We Treat You Right" Bank. Die-Cast metal with rubber tires. #9 in the DQ Series. 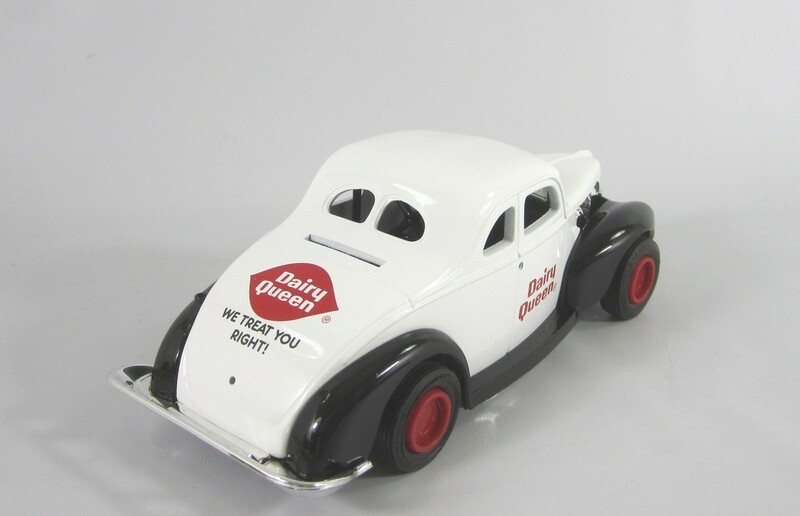 Ertl Stk# F970 Dairy Queen 1940 Ford Modified Race Car Bank. DQ, We Treat You Right. 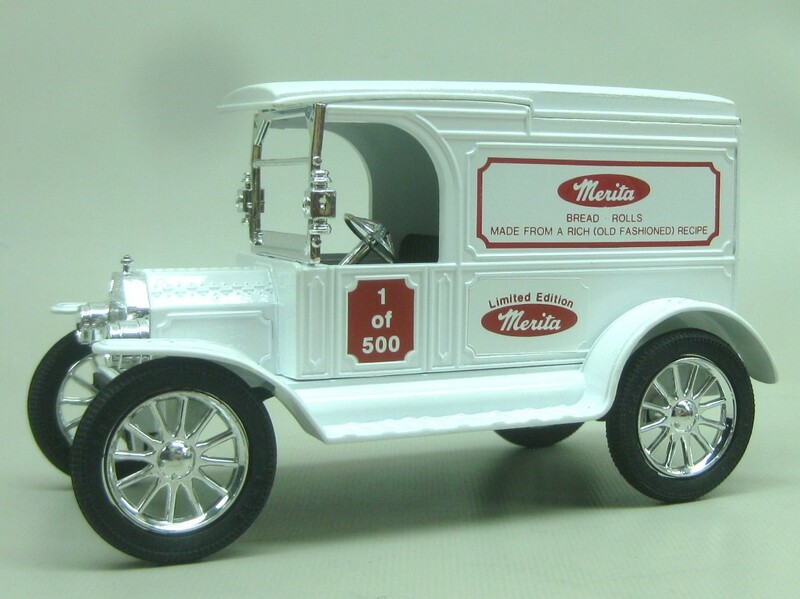 Die-Cast metal with rubber tires. Door handles, gas cap and instructions are in sealed parts bag from factory. #17 in the DQ seriers. 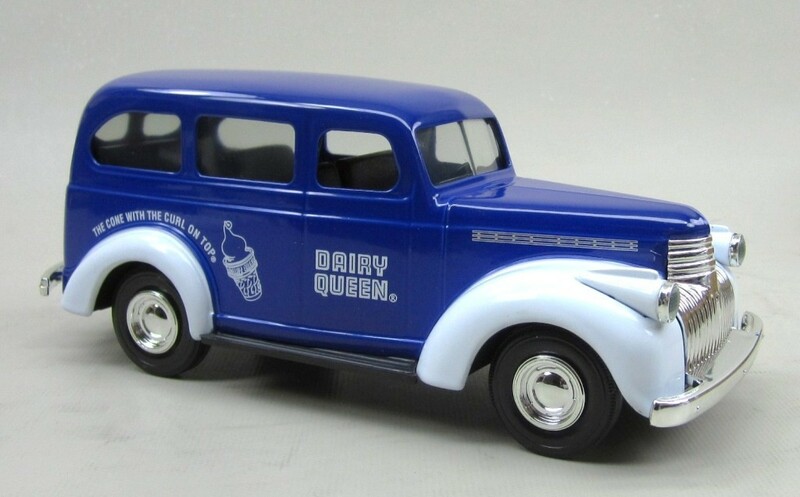 Ertl Stk# 19502 Dairy Queen 1946 Chevrolet Suburban Truck Bank. DQ, "The Cone with the Curl on Top". Die-Cast metal with rubber tires. I think this was #19 in the series. 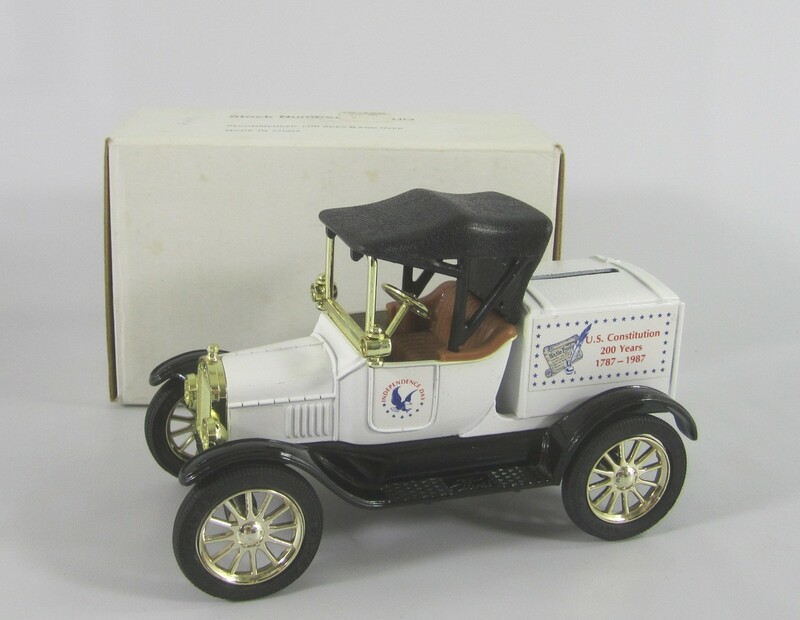 Spec Cast, Liberty Classics Stk# 1928 Ford Model A Roadster Car Bank. 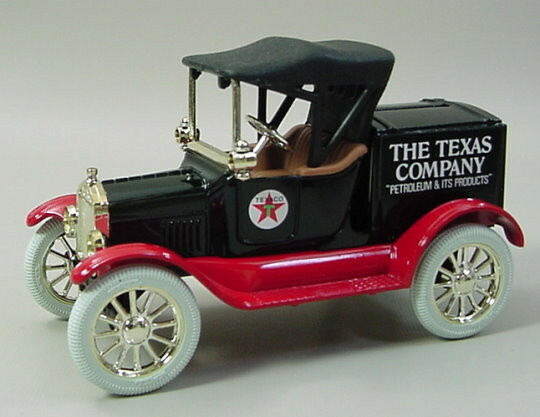 The Eastwood Company Die-cast 1/25 scale (7-1/4 in long). New in Box, Opened only for photo. 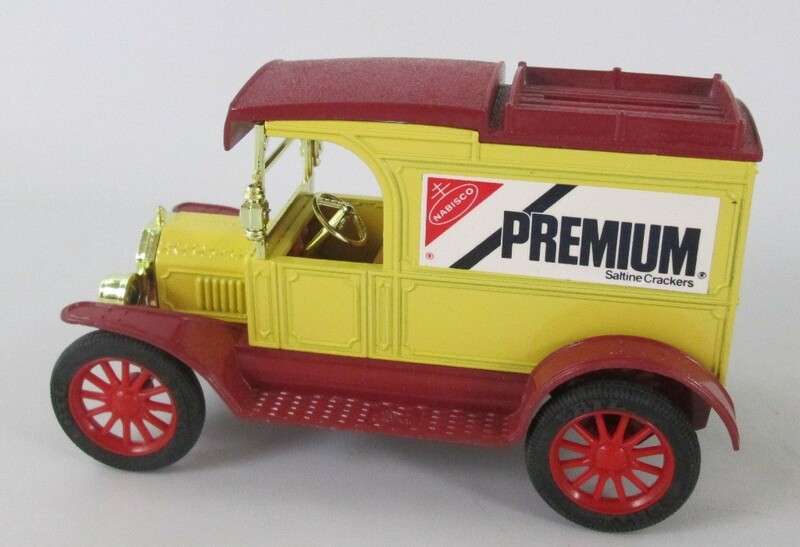 Ertl Stk# 1664, 1931 Hawkeye Delivery Truck. 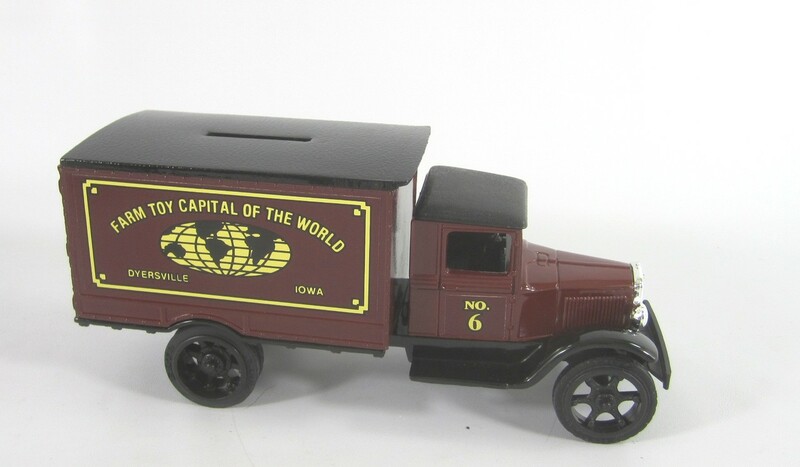 This Die-cast coin bank is #6 in the Farm Toy Capital of the World series from Dyersville Iowa. 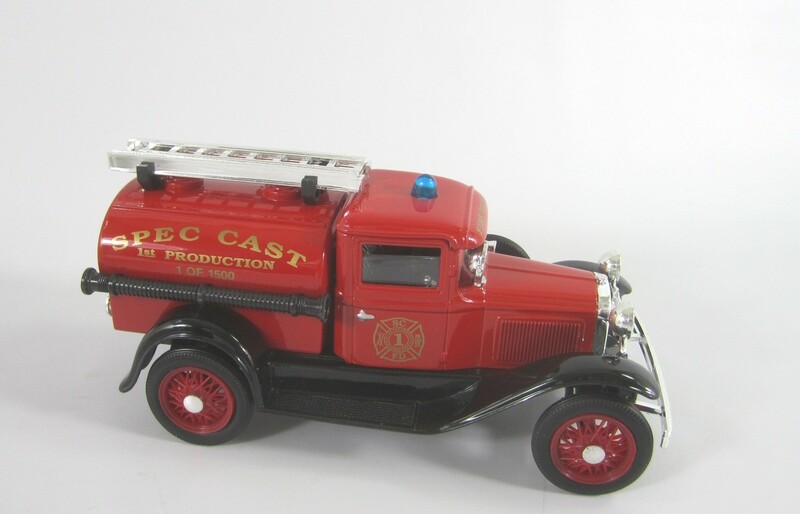 Spec Cast, Liberty Classics Stk# 10006, 1937 Chevrolet Cabriolet Fire Chief #4 Car Bank. 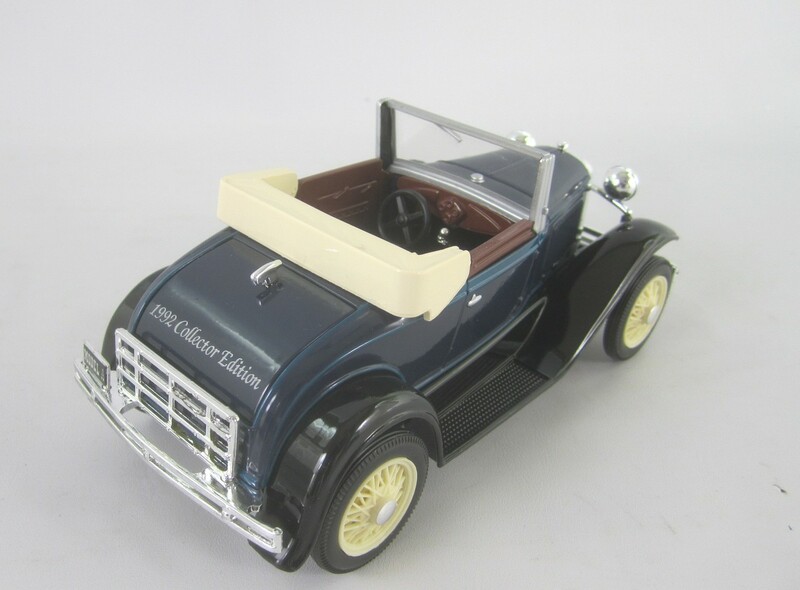 Die-cast 1/25 scale (7 in long). 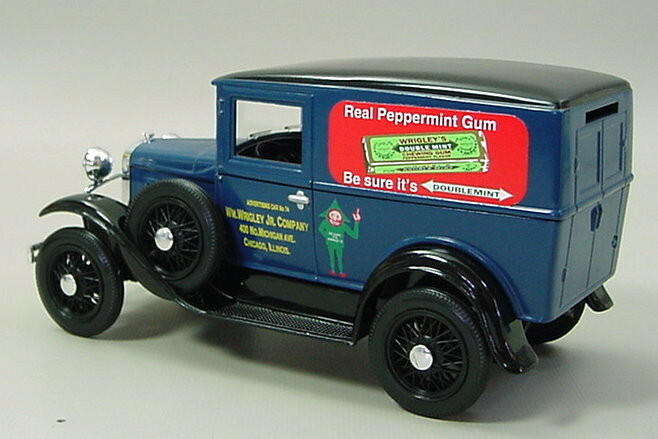 The coin slot is hidden in the Rumble Seat. New in Box, Opened only for photo. 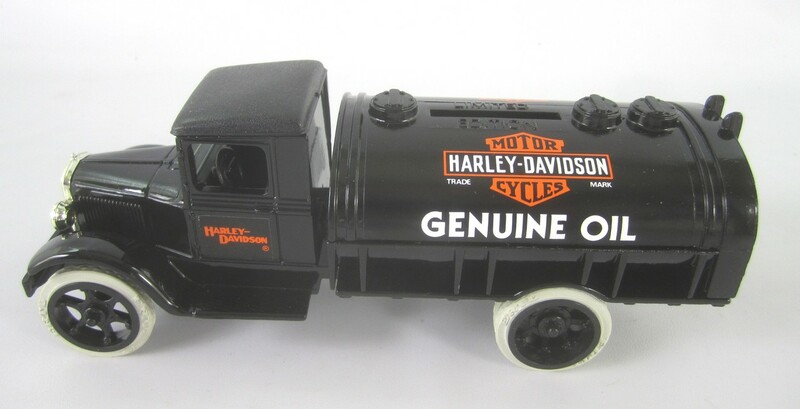 Ertl Stk# 9135 1926 Mack Harley Davidson Bank with crates. 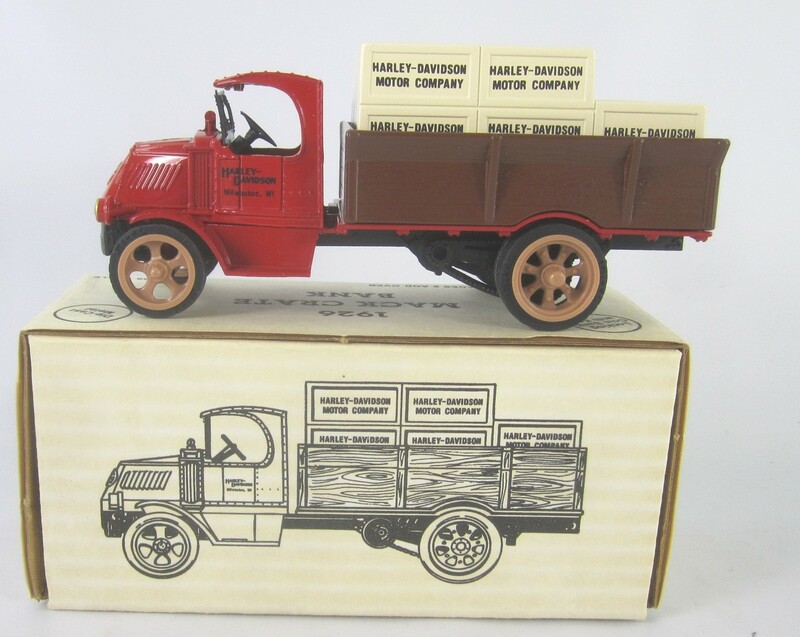 Die-Cast metal with rubber tires. Made in USA. 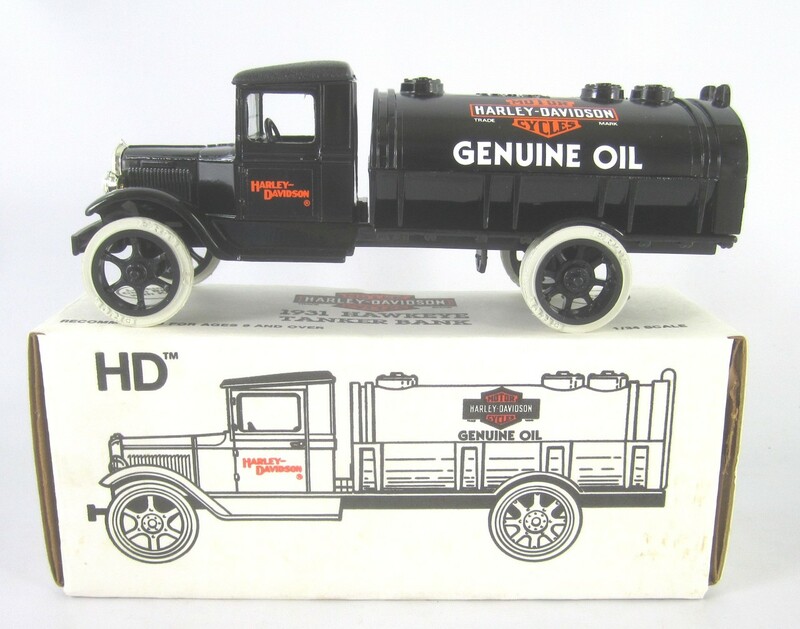 Ertl Stk# 9164 1931 Hawkeye Tanker Harley Davidson Bank. Die-Cast metal with rubber tires. Made in USA. 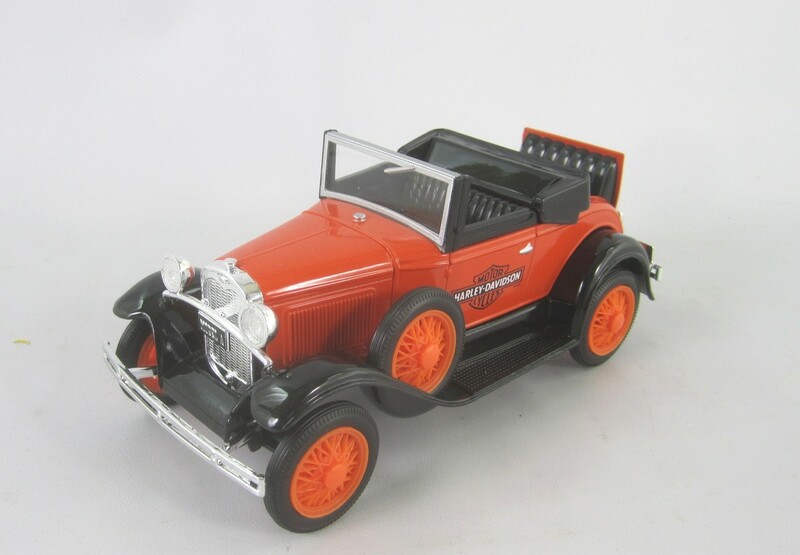 Spec Cast, Liberty Classics Stk# 1929 Ford Model A Roadster Car Bank. 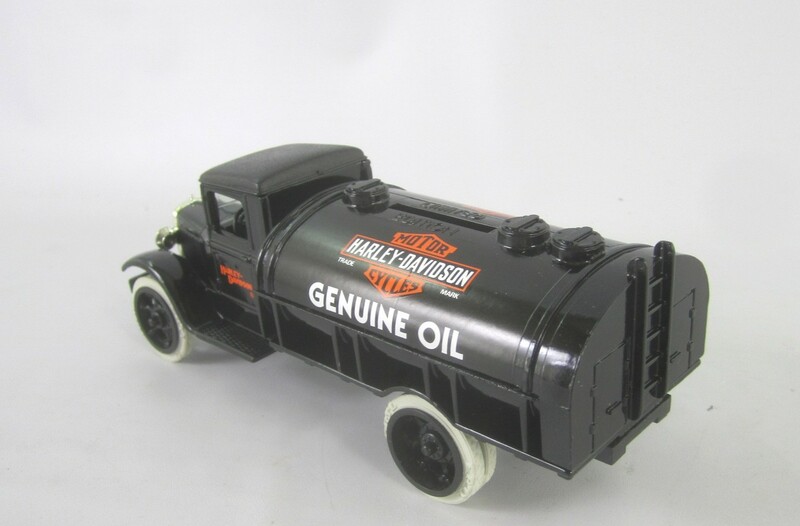 Harley Davidson Motorcycles, Die-cast 1/25 scale (7-1/4 in long). 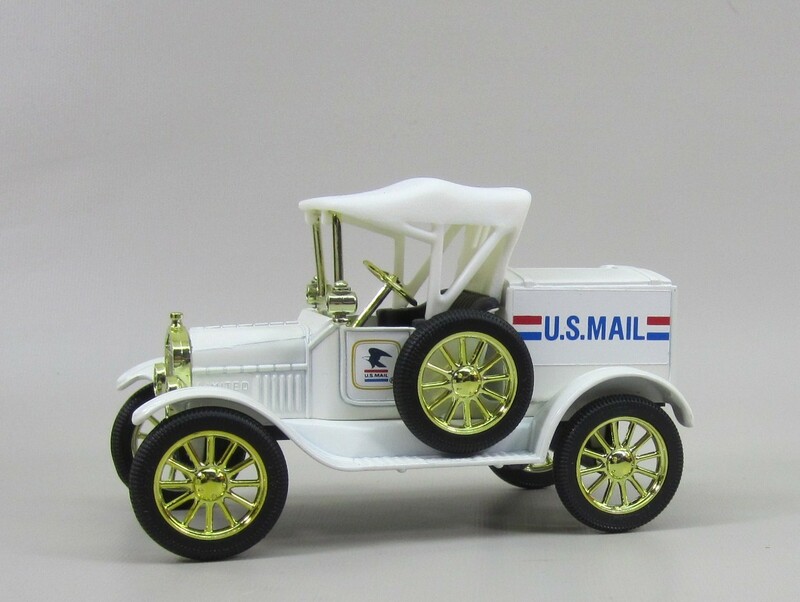 Spec Cast, Liberty Classics Stk# 1018 Ford Model A Pickup Bank. 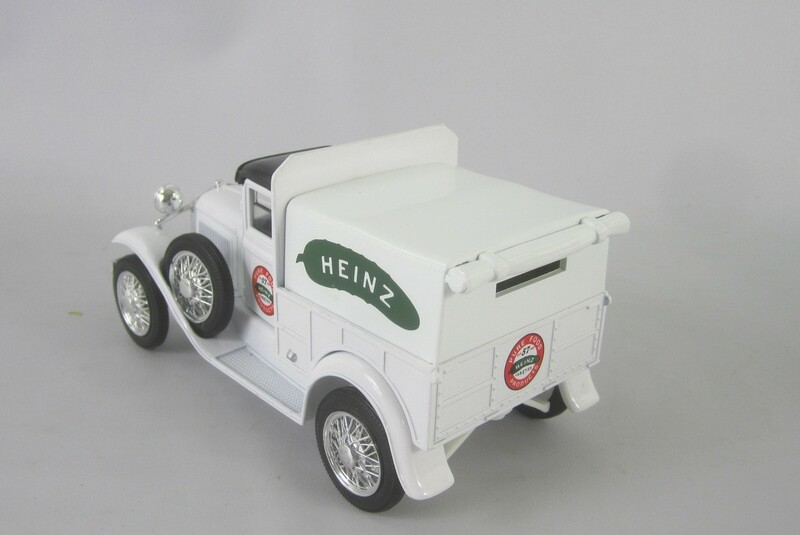 Heinz Pickles. Coin slot in back. 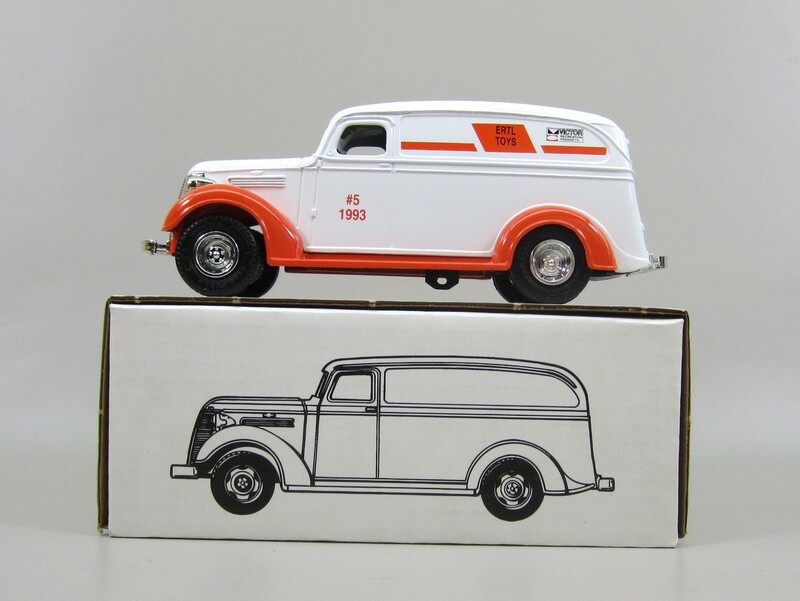 Die-cast 1/25 scale. 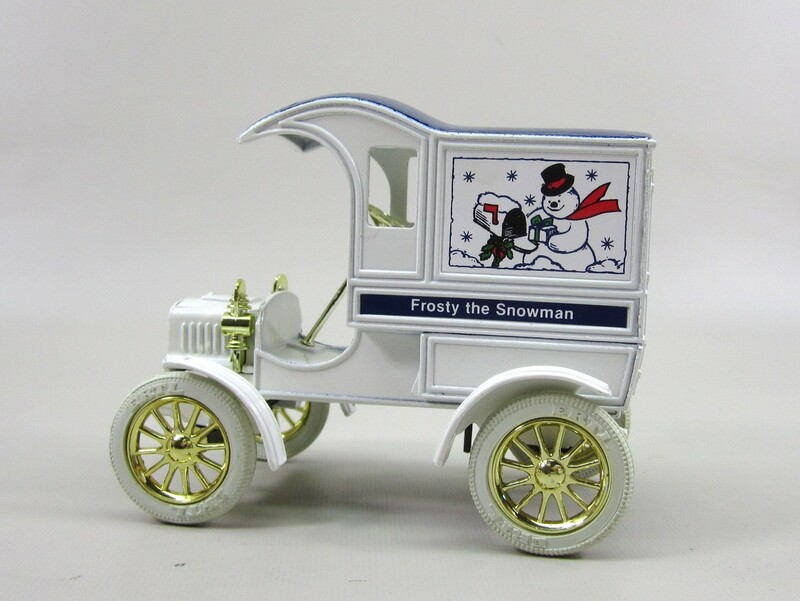 Ertl Stk# 9499 1905 Ford T Delivery Frosty the Snow Man, Indendence Iowa. 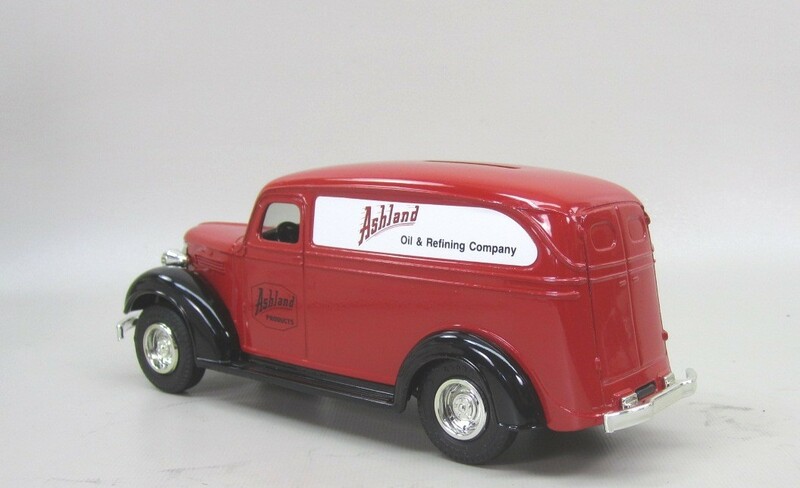 Diecast 1/25 scale with rubber tires. Coin slot in roof. Made in USA. 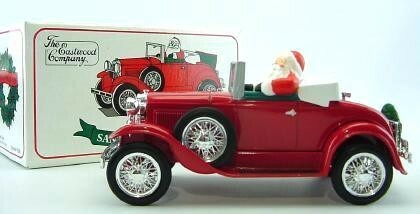 Christmas series from 1987 and only 500 made. 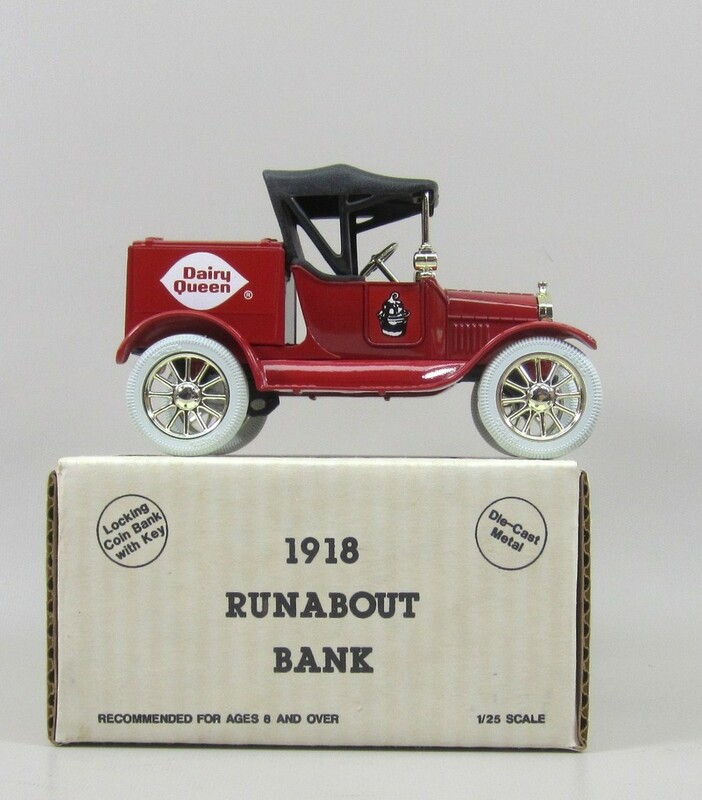 Ertl Stk# 9194 1918 Ford T Runabout Independence Iowa Car bank. 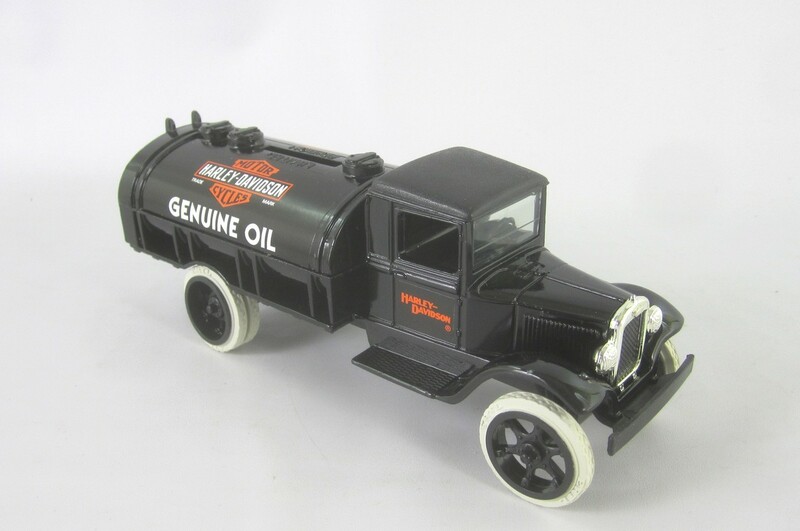 Diecast 1/25 scale with rubber tires. 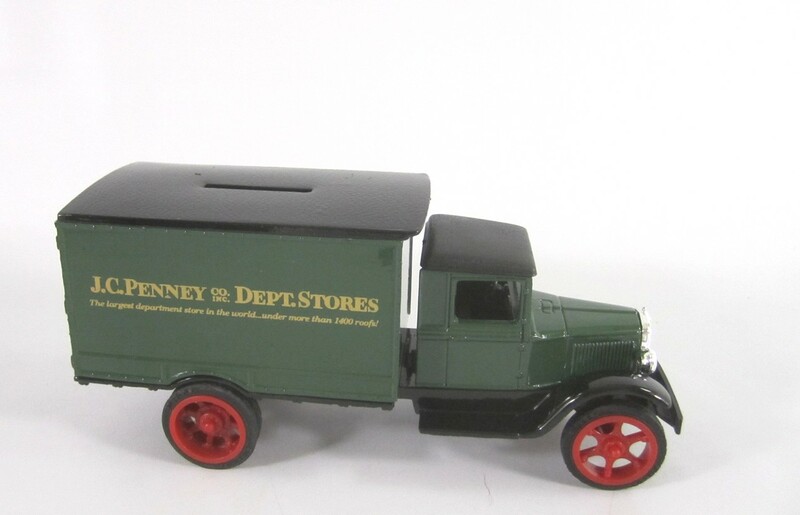 Coin slot in delivery box. 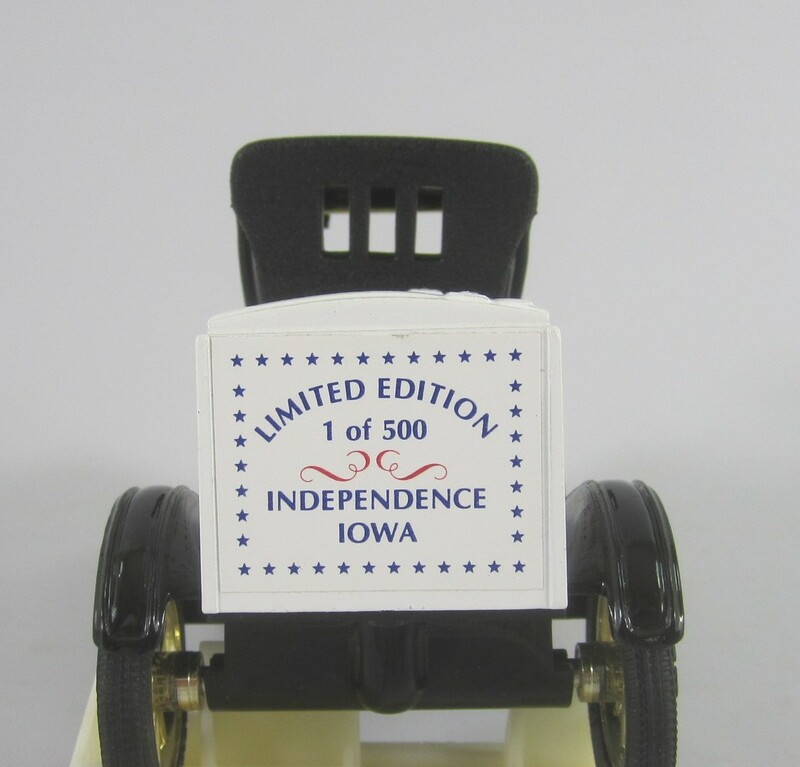 July 4th series from 1987 and only 504 made. 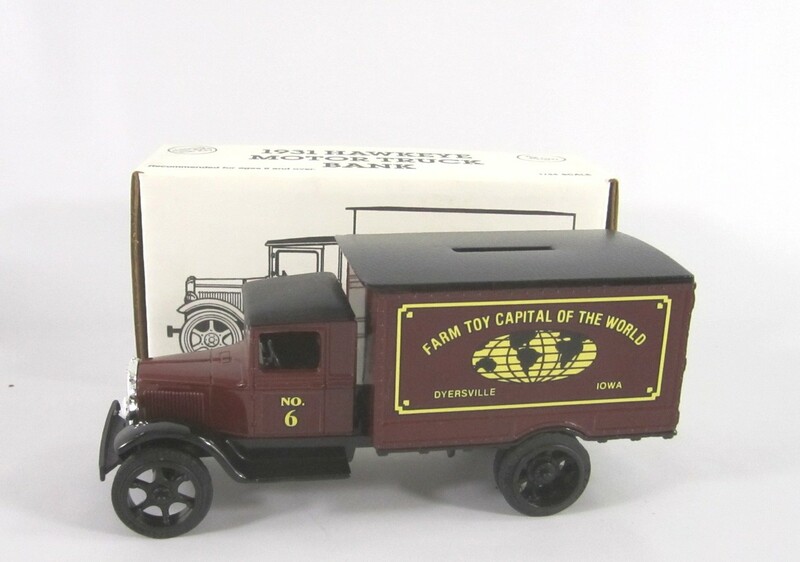 Ertl Stk# 9747 1923 Chevy Panel 1/2 tonTruck Bank. 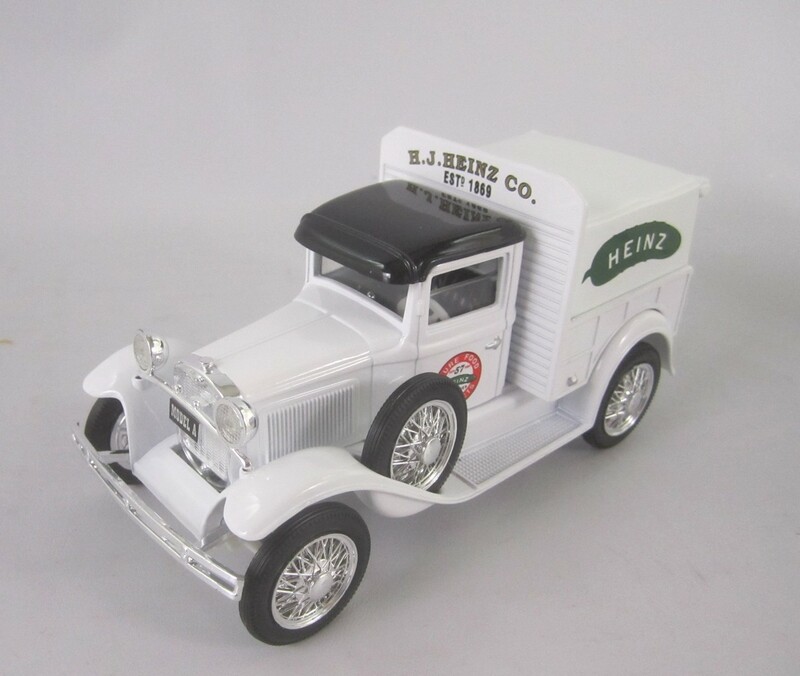 Diecast 1/25 scale with rubber tires. Coin slot in roof. 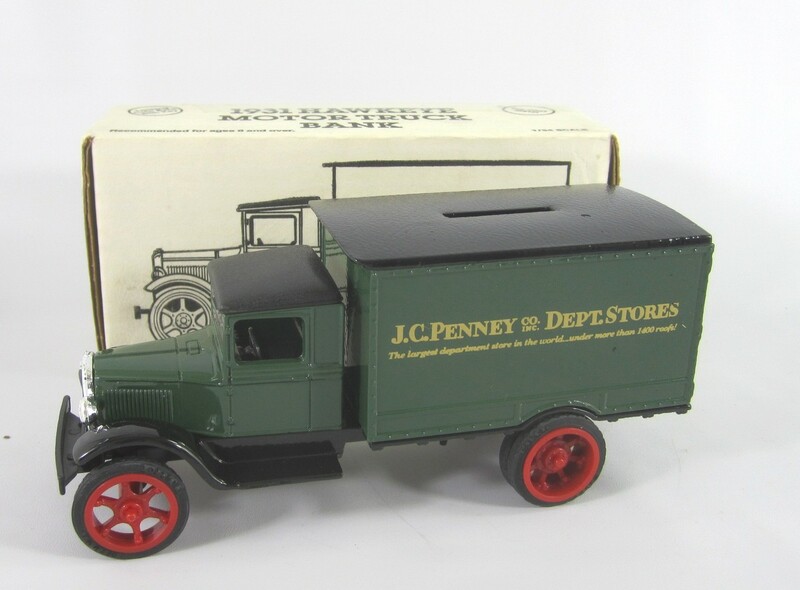 J.C. Penny Co. "175 Busy Stores"
Ertl Stk# 9444, 1931 Hawkeye Delivery Truck. 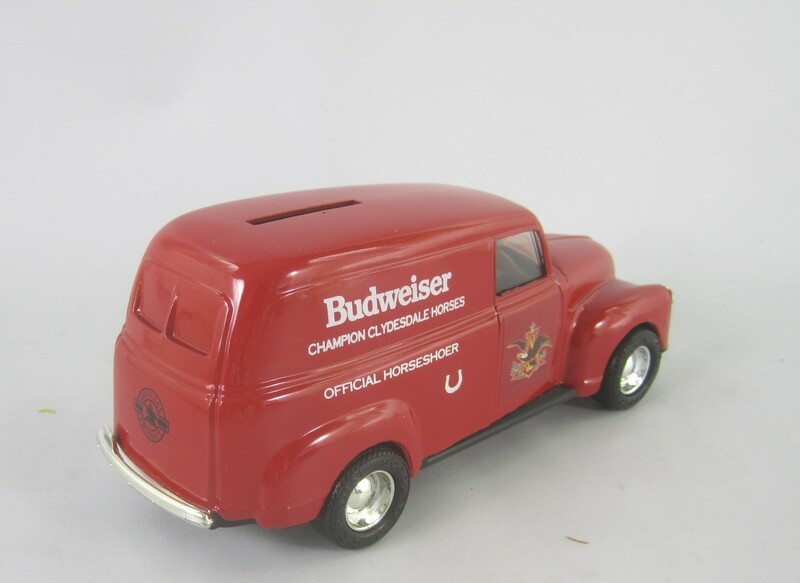 This coin bank is Die-cast metal with rubber tires. Condition: New in Box, Opened only for photo. 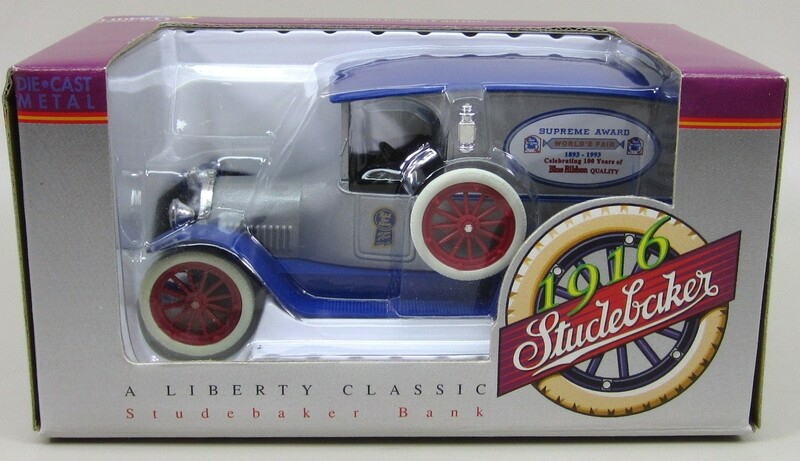 Spec Cast, Liberty Classics Stk# 1500 Ford Model A Roadster Car Bank. 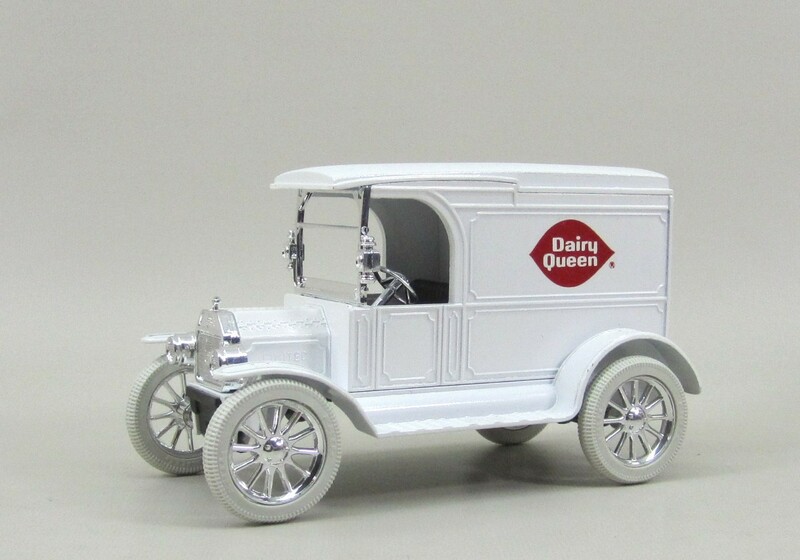 Liberty Classic Die-cast 1/25 scale (7-1/4 in long). New in Box, Opened only for photo. 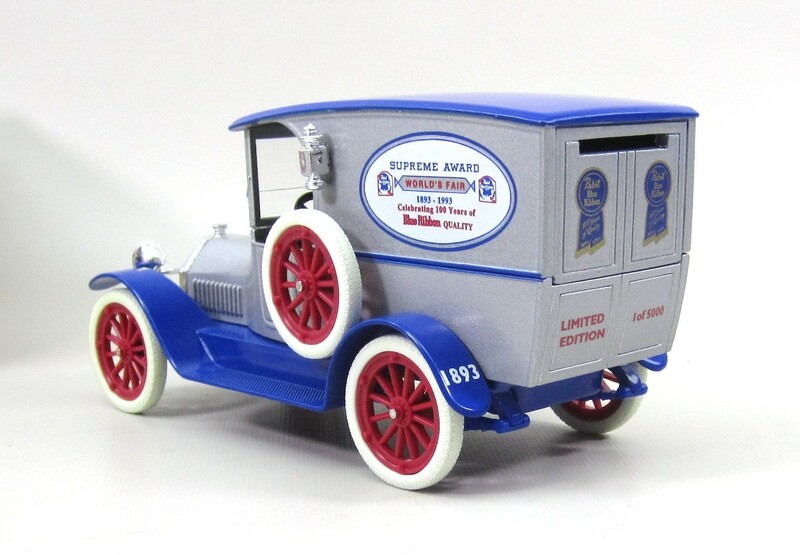 Ertl Stk# 9297UO 1917 Ford T Delivery Van. 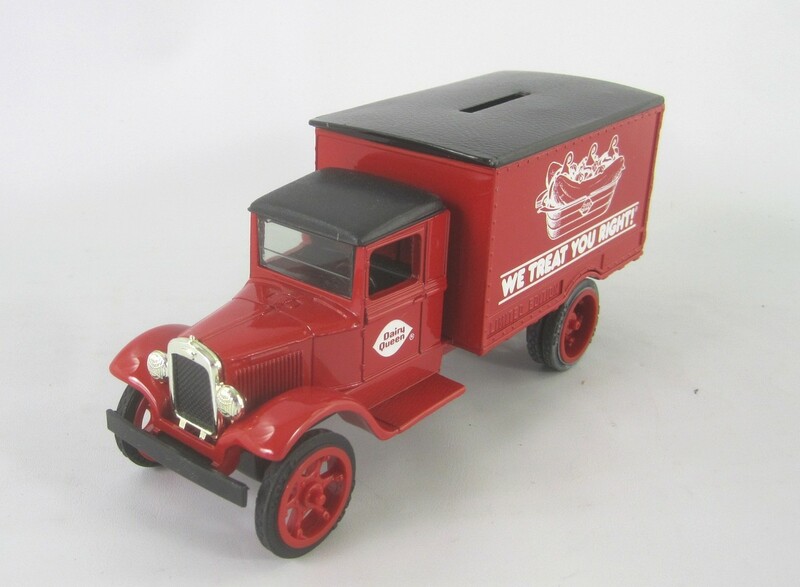 This coin bank was made for Merita Bread. Limited 1 of 500. 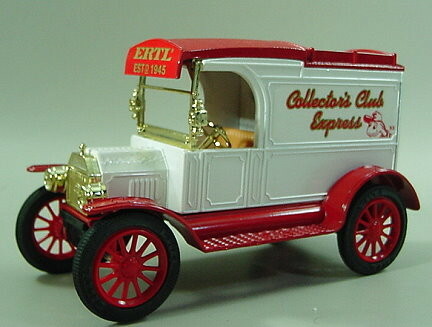 Die-cast 1/25 scale (6 in long). Opened only for Photo. 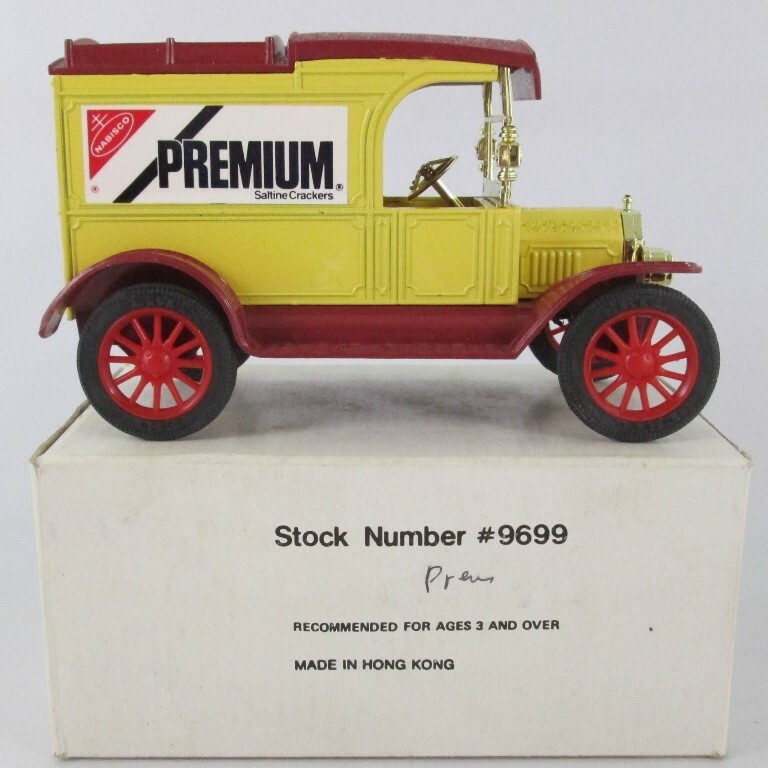 Ertl Stk# 9699 Nabisco Premium Crackers 1913 Ford Model T Bank. 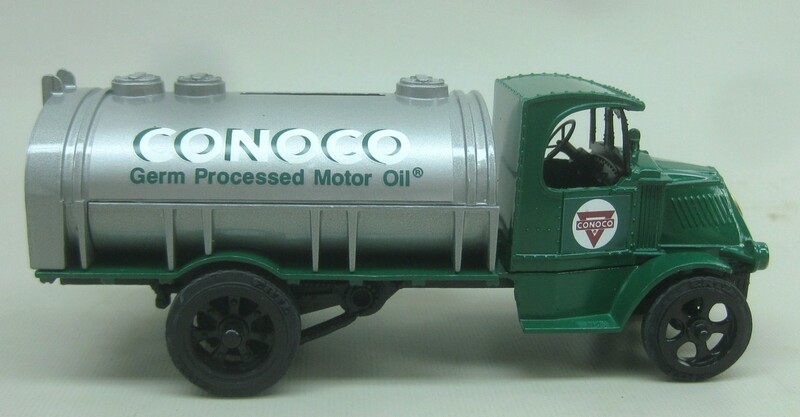 Die-Cast metal with rubber tires. Coin Slot in Roof. 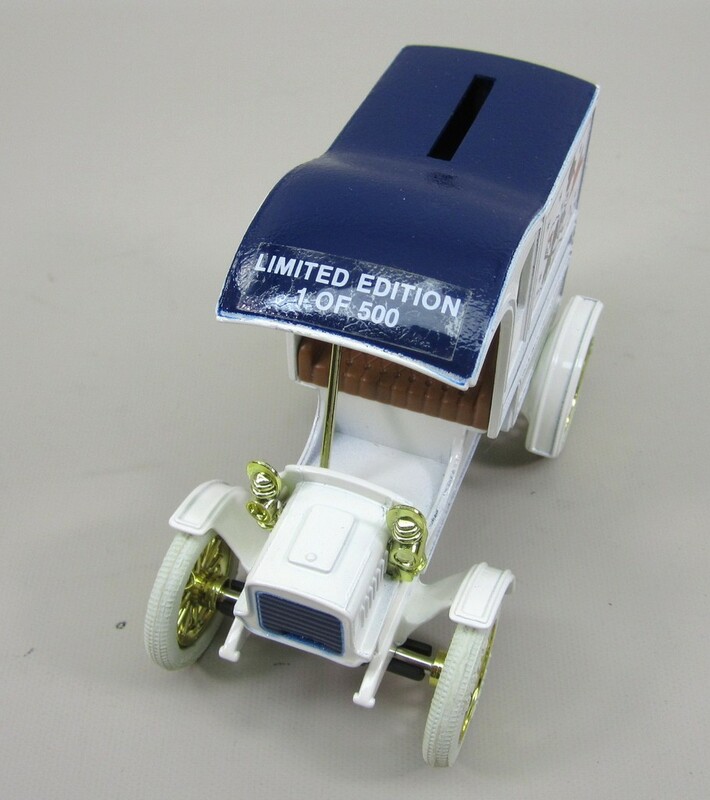 Spec Cast, Liberty Classics Stk# 25001 Pabst Brewing 100th Anniversary 1916 Studebaker truck bank. 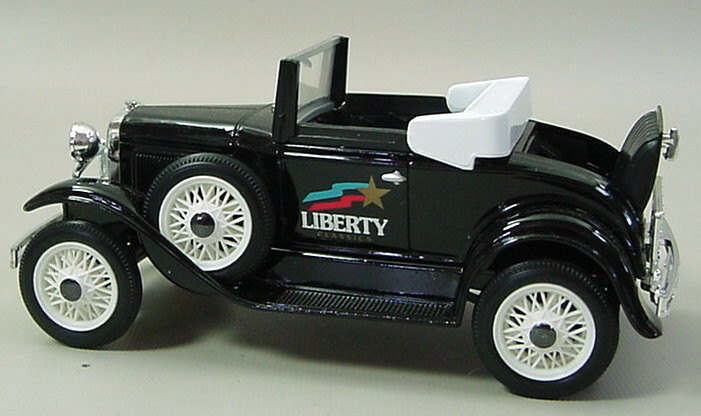 Liberty Classic Die-cast (6-1/2 in long). New in Box, Opened only for photo. 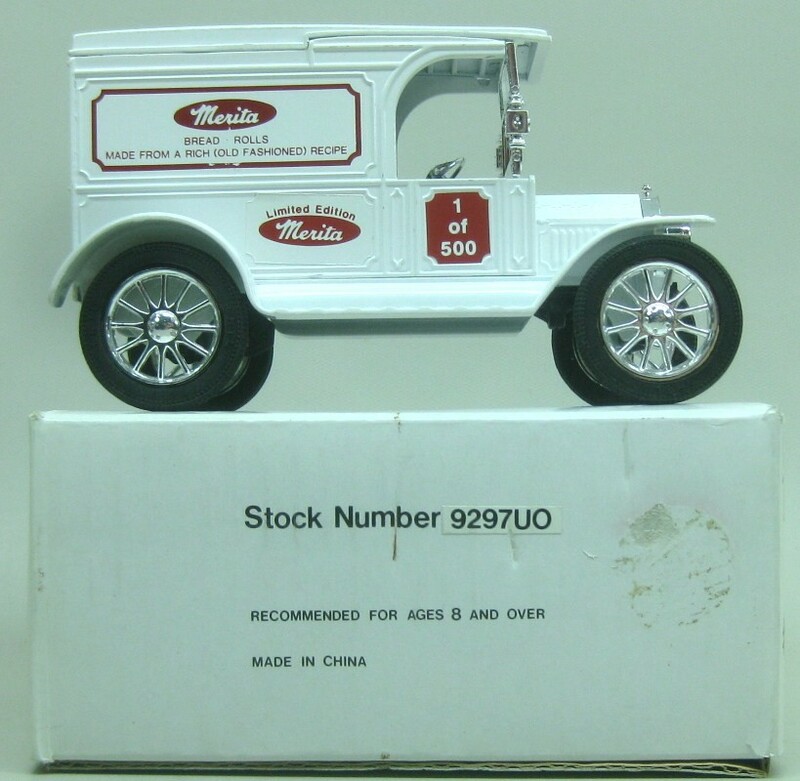 Spec Cast, Liberty Classics Stk# M24205 Ford Model A Panel Bank. 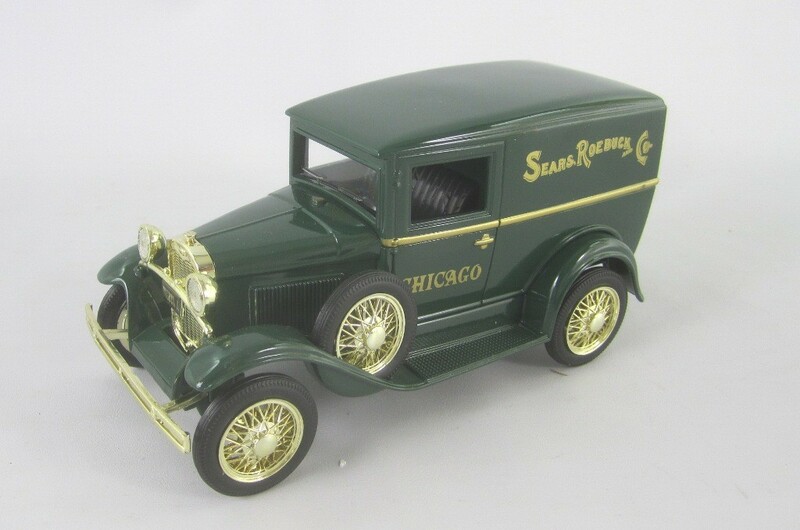 Sears Roebuck & Co, Chicago IL. Coin slot in back. 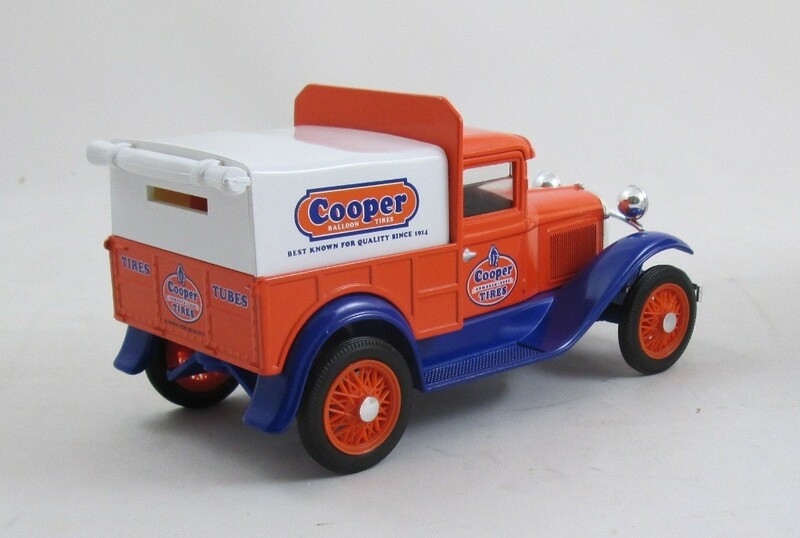 Die-cast 1/25 scale. 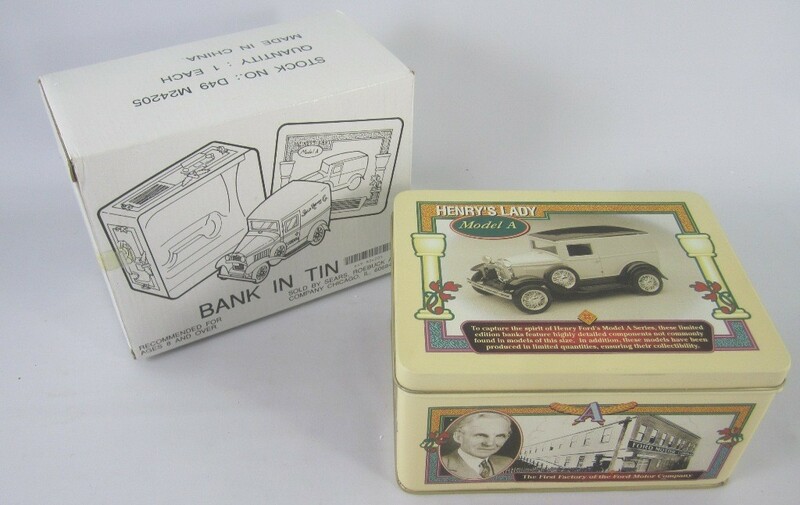 Comes in decorated Tin box. 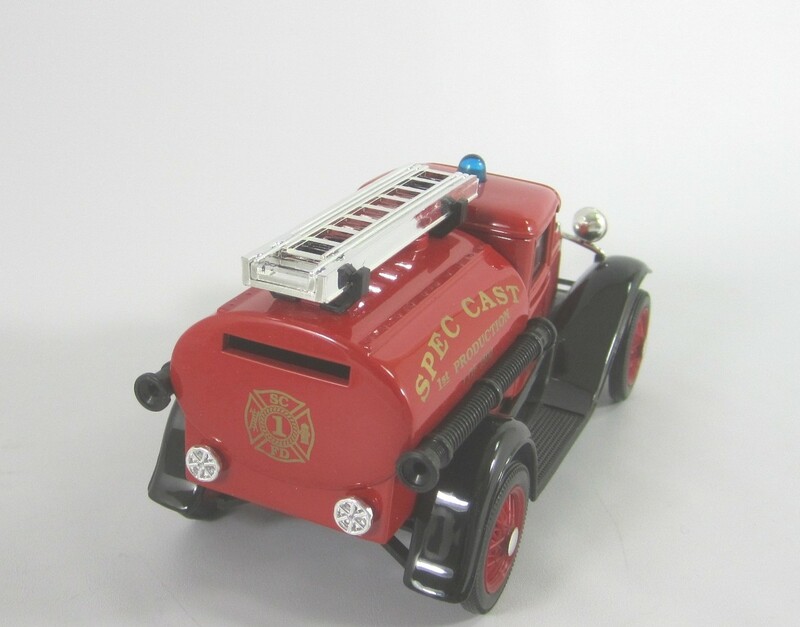 SpecCast, Liberty Classics Stk# 2013 Ford Model A Fire Truck Bank. 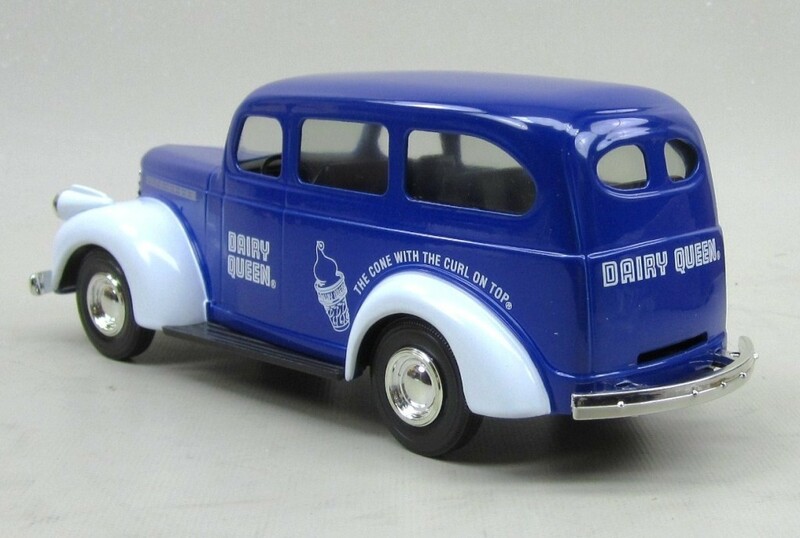 Die-cast 1/25 scale. Limited Edtion 1 of 1500. 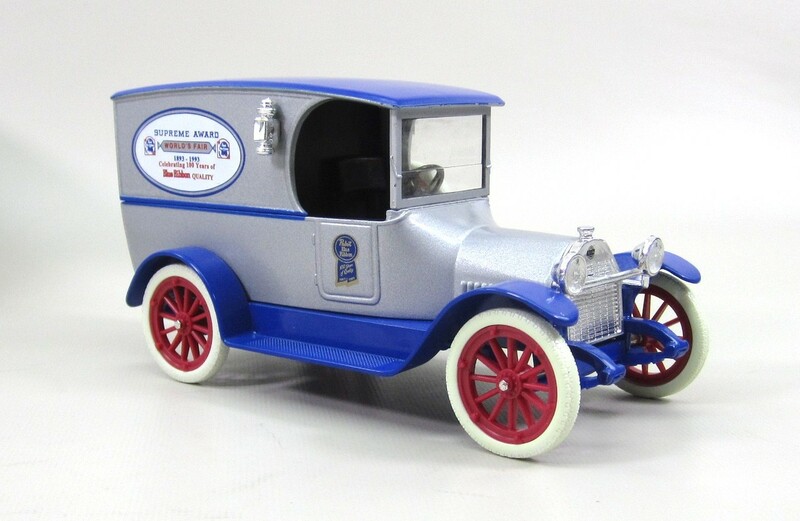 Spec Cast, Liberty Classics Stk# 1012 Ford Model A Pickup Bank. 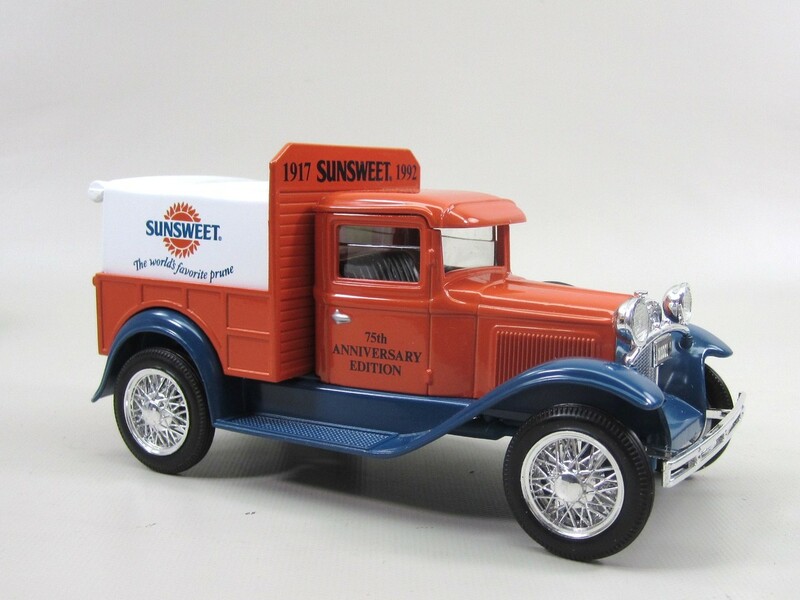 Sunsweet 75th Anniversary Edition, 1017 - 1992. Coin slot in back. 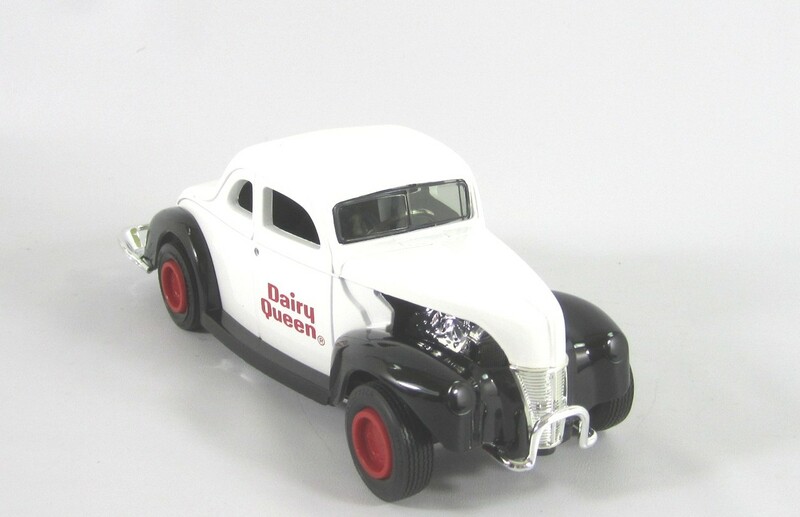 Die-cast 1/25 scale. 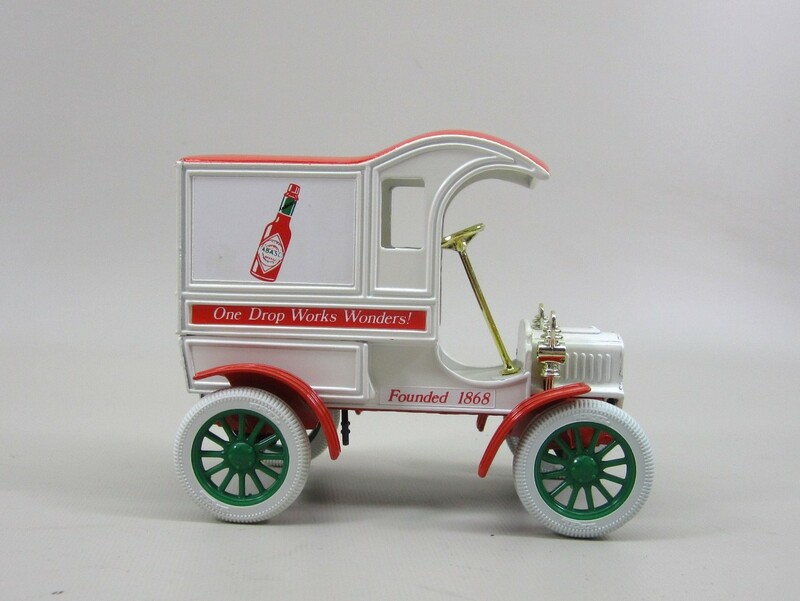 Ertl Stk# 9878 1905 Ford T Delivery Tabasco Sauce. 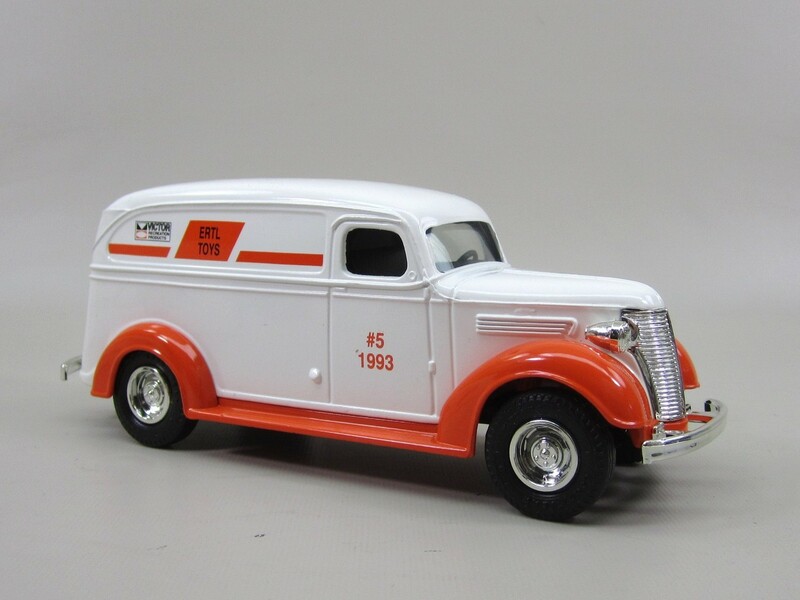 Diecast 1/25 scale with rubber tires. Coin slot in roof. Made in USA. #1 in the series from 1988 and only 1020 made. 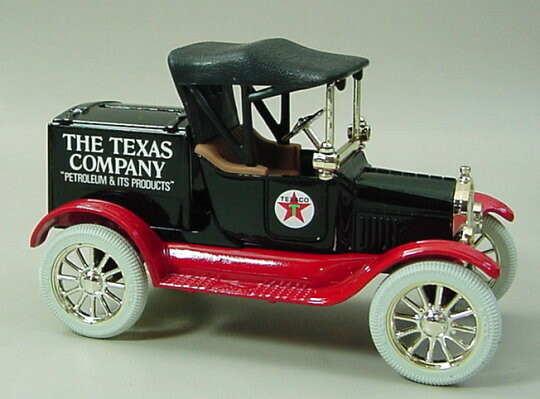 Ertl Stk# 9740 1918 Ford T Runabout Texaco. 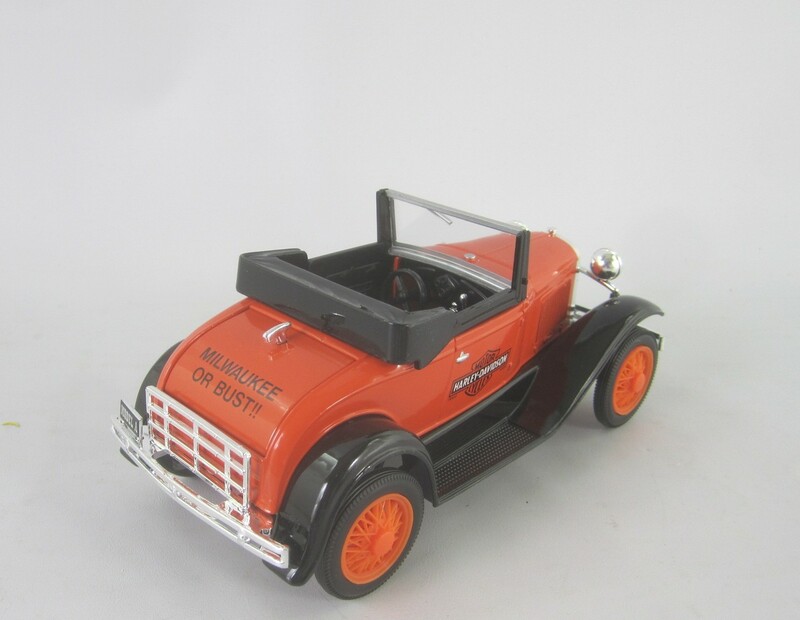 Diecast 1/25 scale with rubber tires. Coin slot in delivery box. Made in USA. 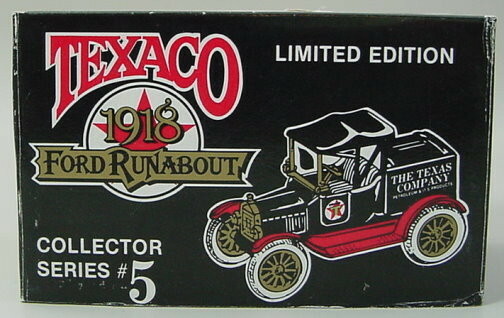 Condition: New in Box, Box shows some shelf wear. 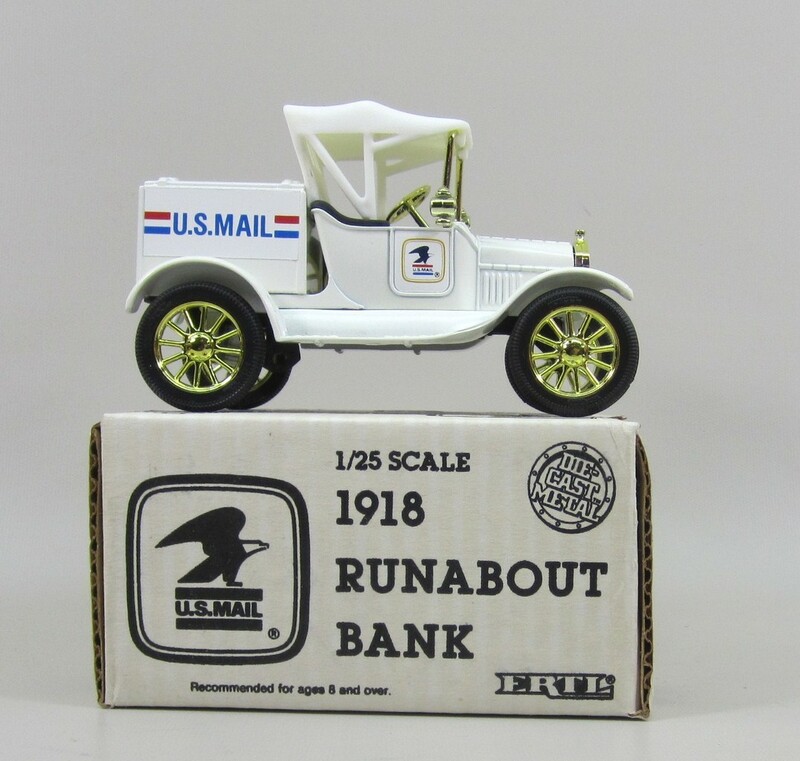 Ertl Stk# 9843 1918 Ford T Runabout US Mail Bank with Spare Tire. 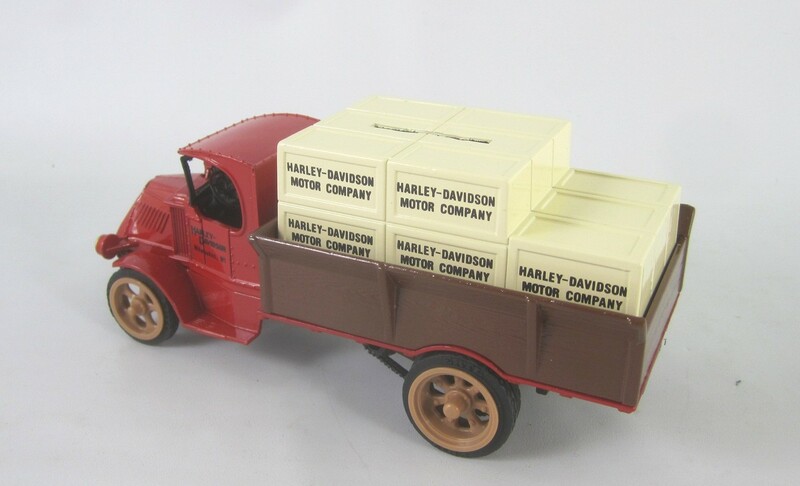 Diecast 1/25 scale with rubber tires. 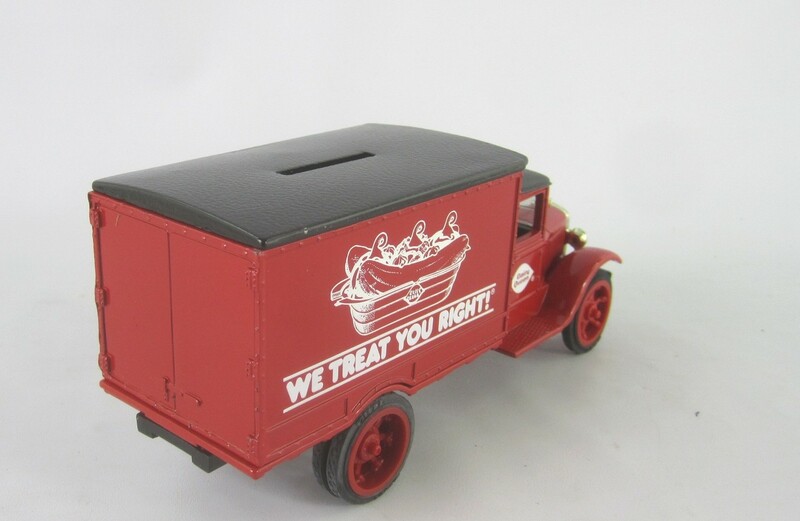 Coin slot in delivery box. Made in USA. Comes with Certificate.